As you can see, there is no formula that I follow. 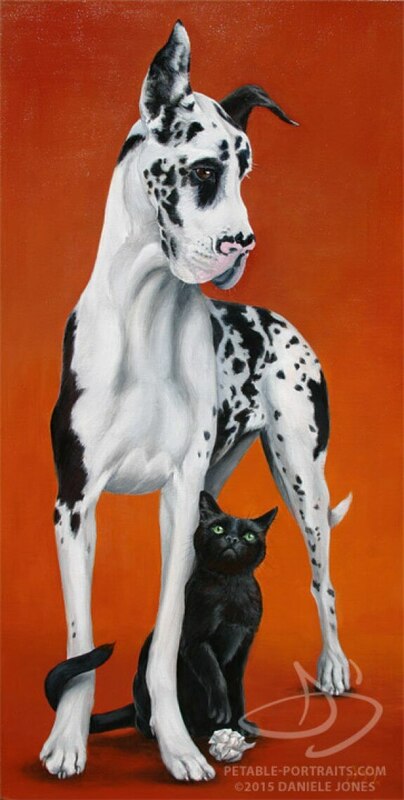 Each pet and composition is unique. 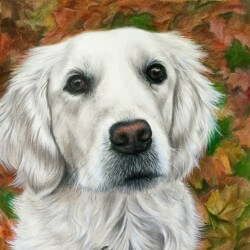 Some of my clients know exactly what they want and some leave it completely up to me to create the artwork. 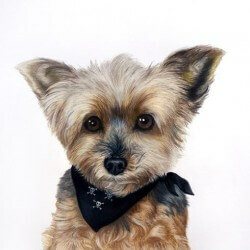 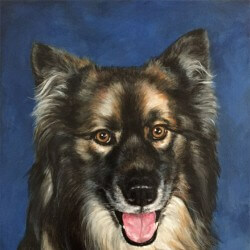 Some of the portraits are simple and showcase only the dog with a studio background or no background. 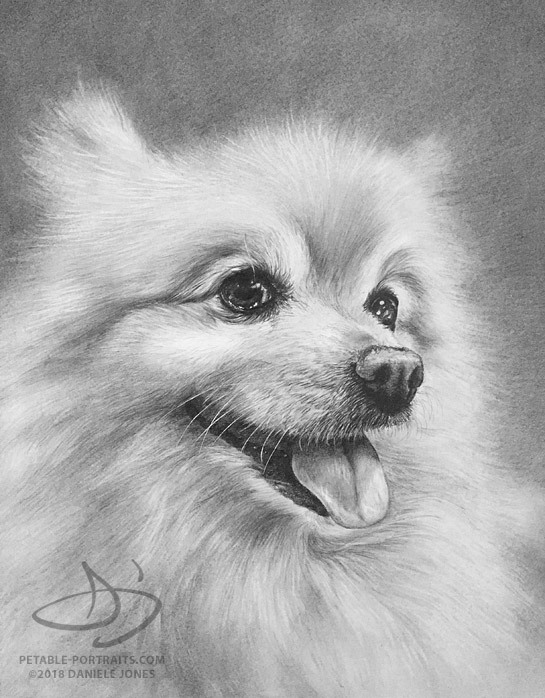 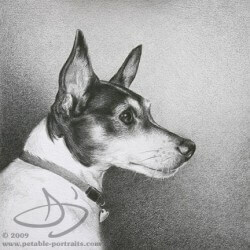 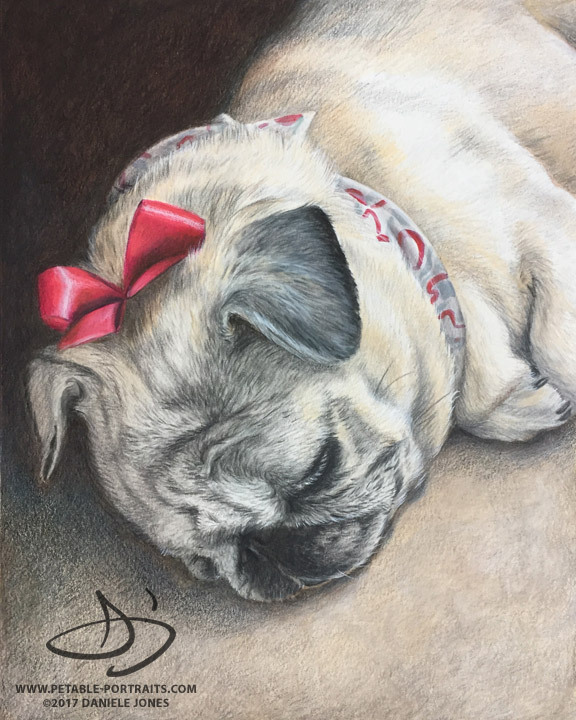 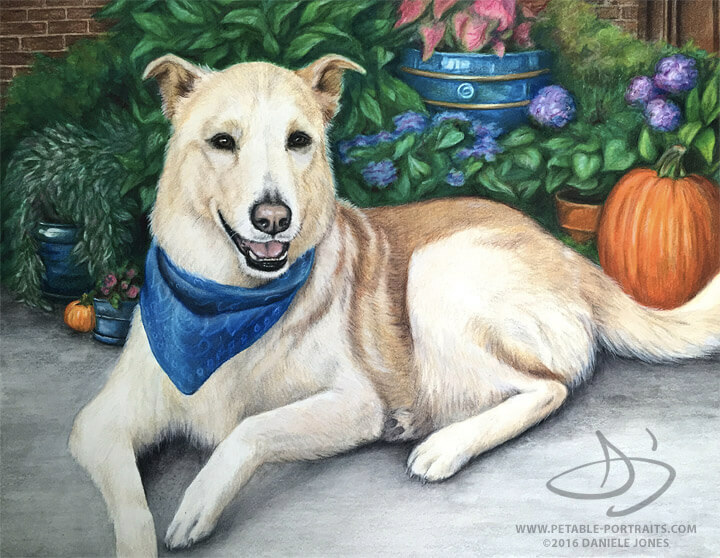 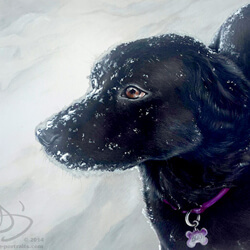 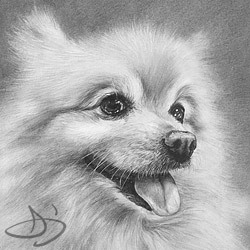 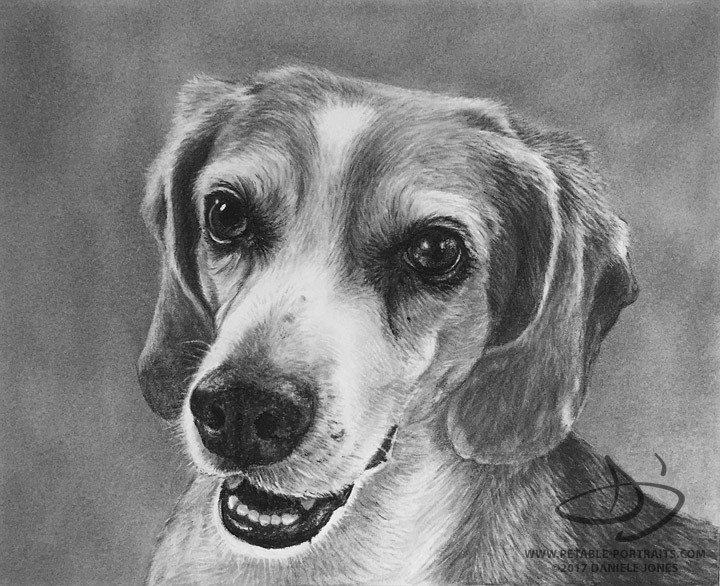 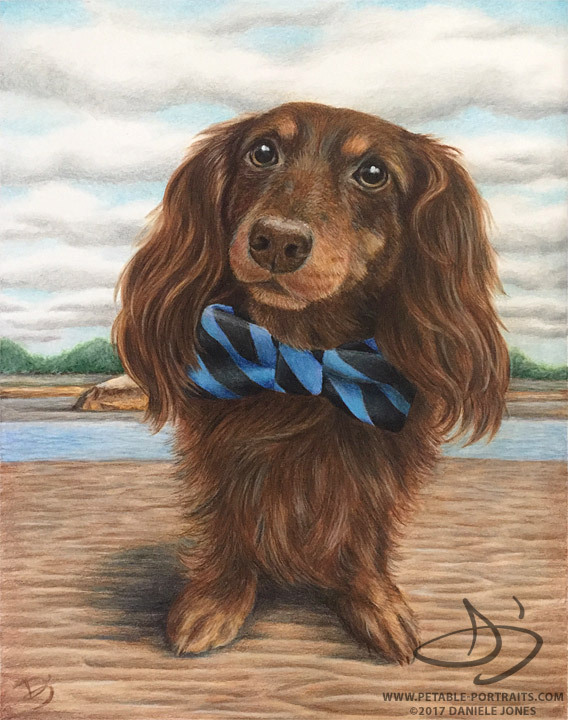 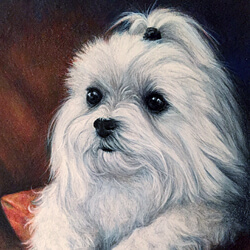 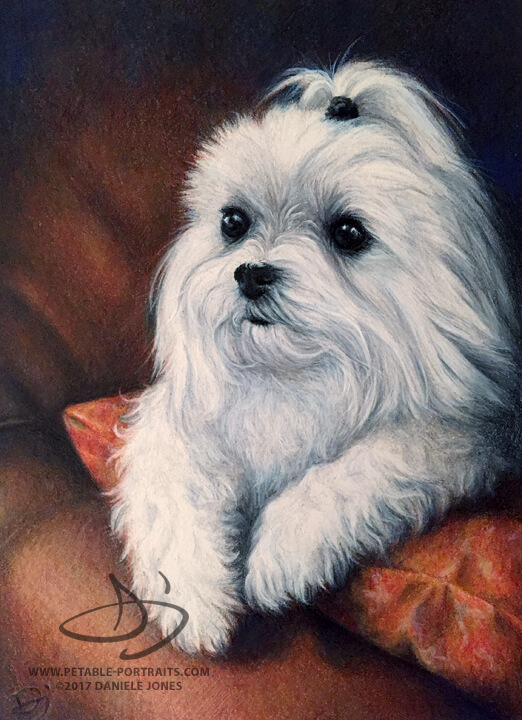 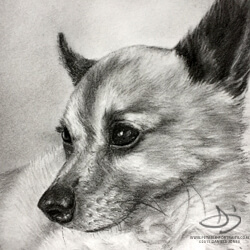 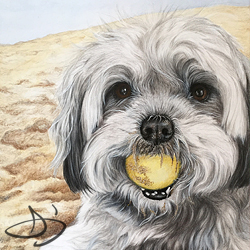 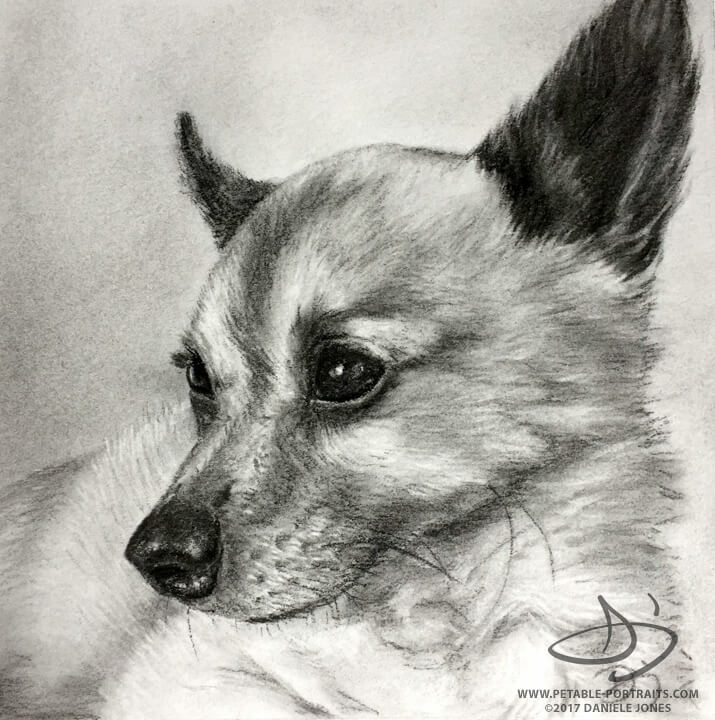 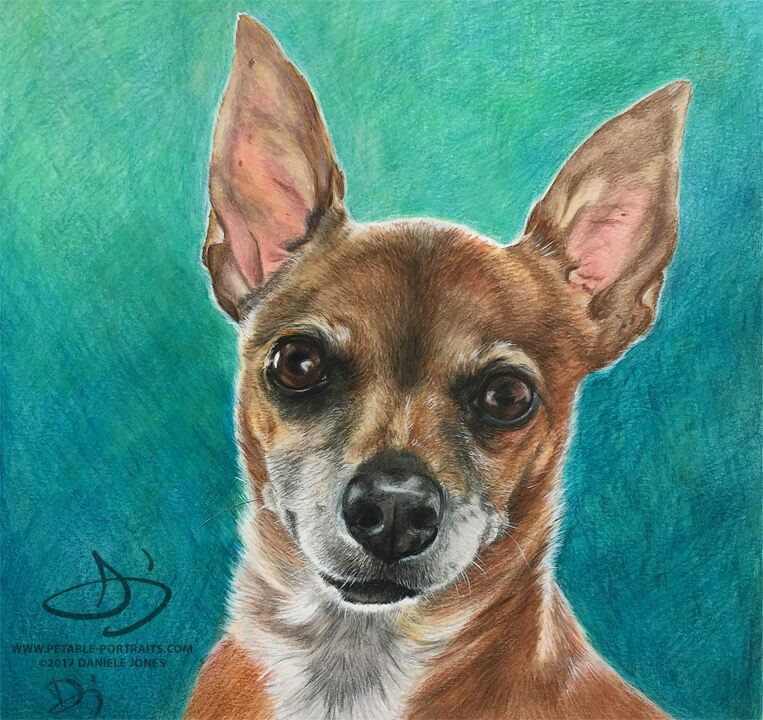 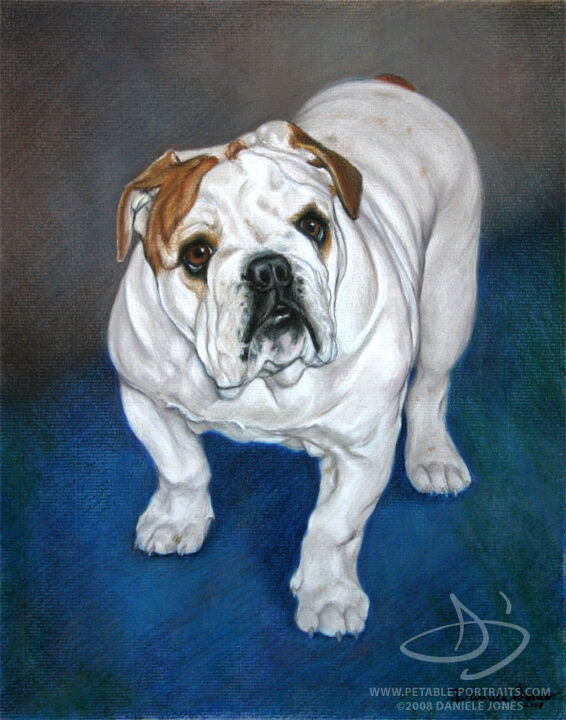 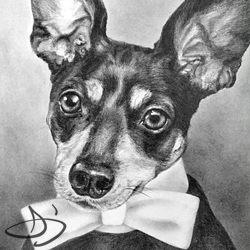 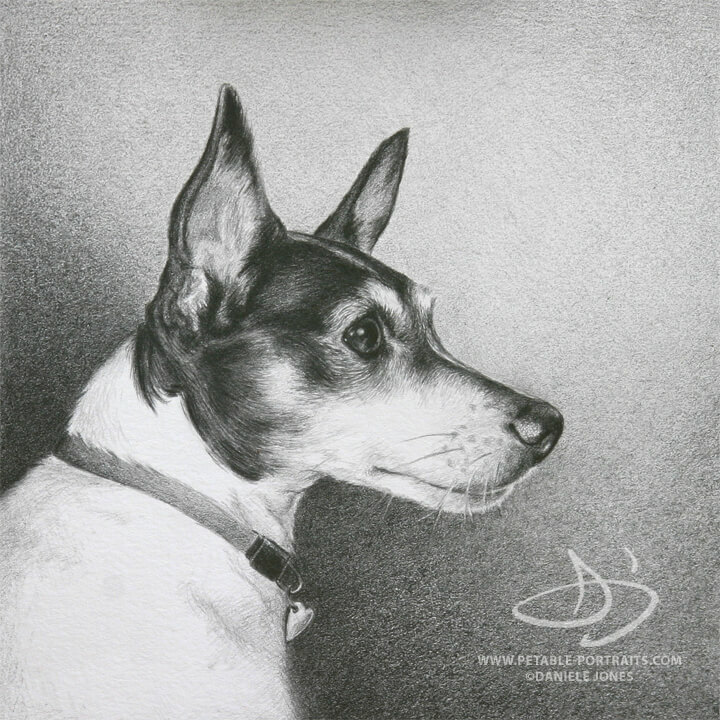 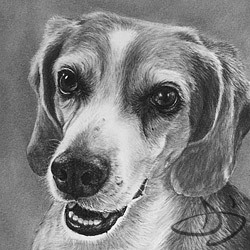 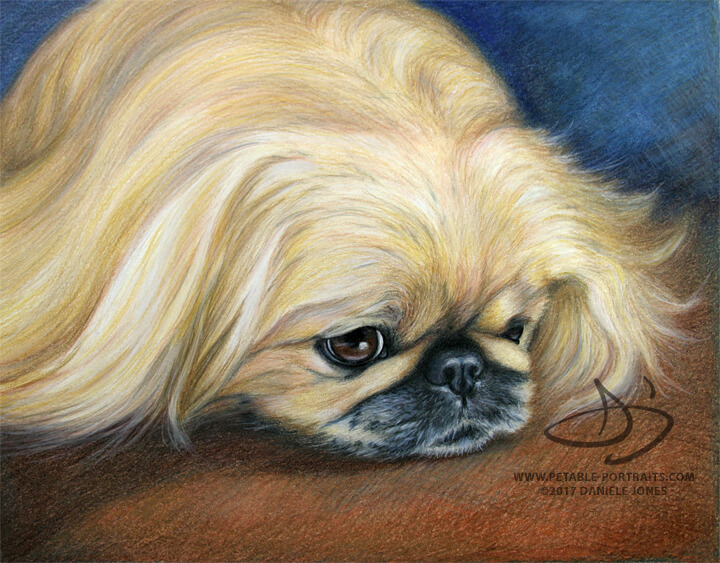 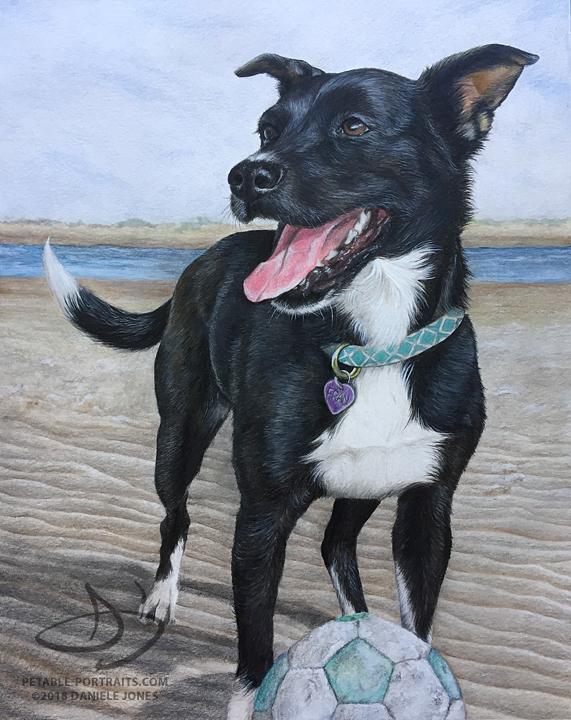 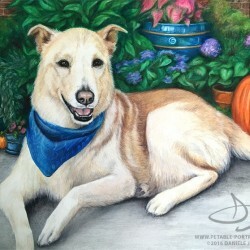 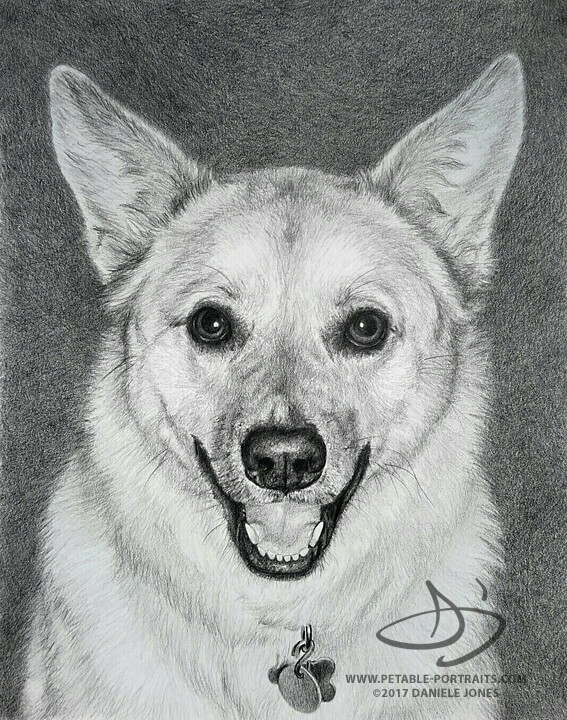 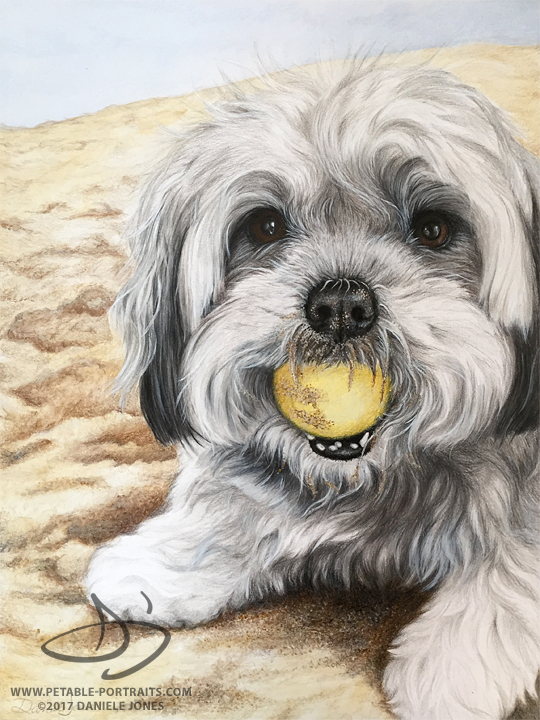 Other portraits are elaborate compilations of ideas and reference photos that tell a story of that pet's life. 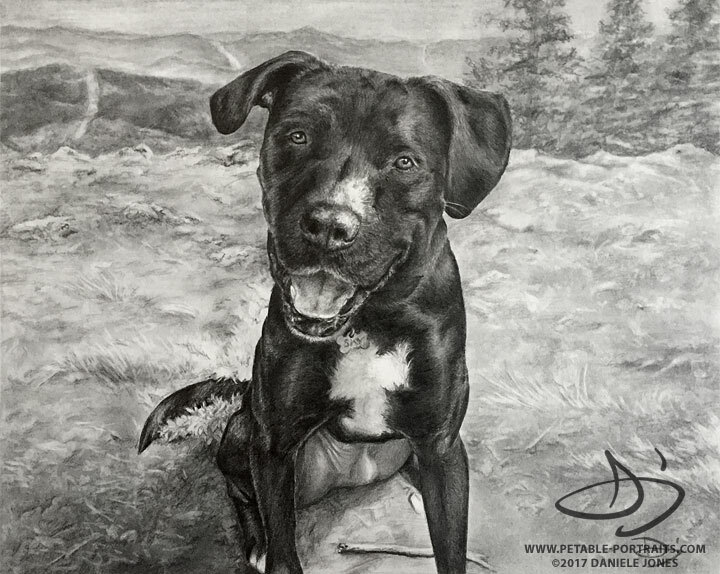 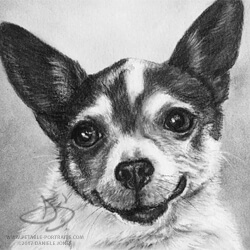 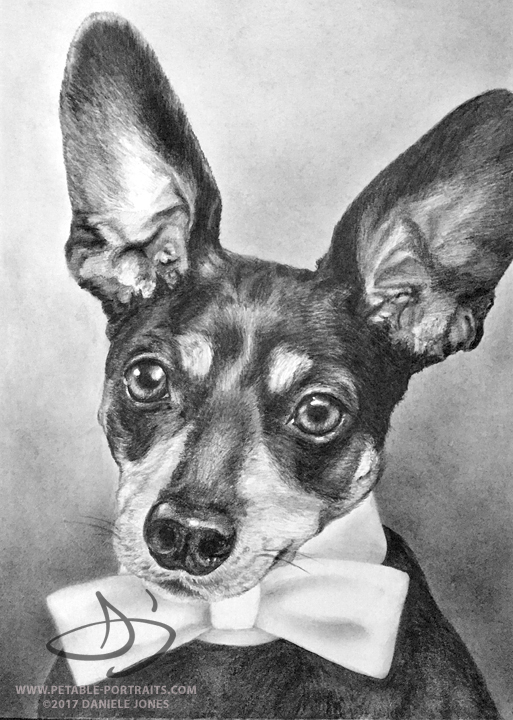 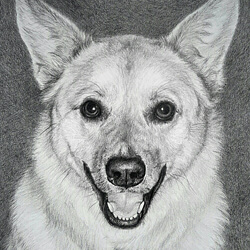 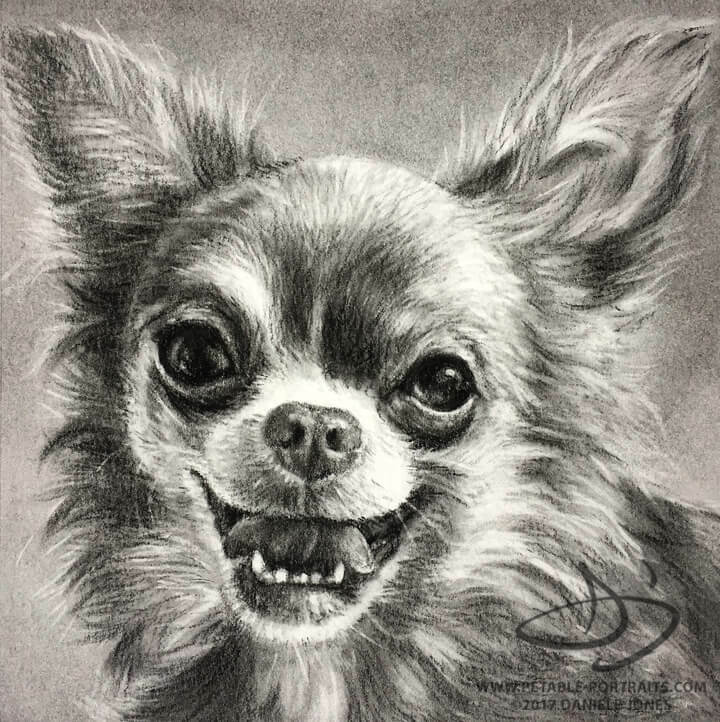 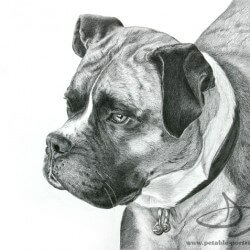 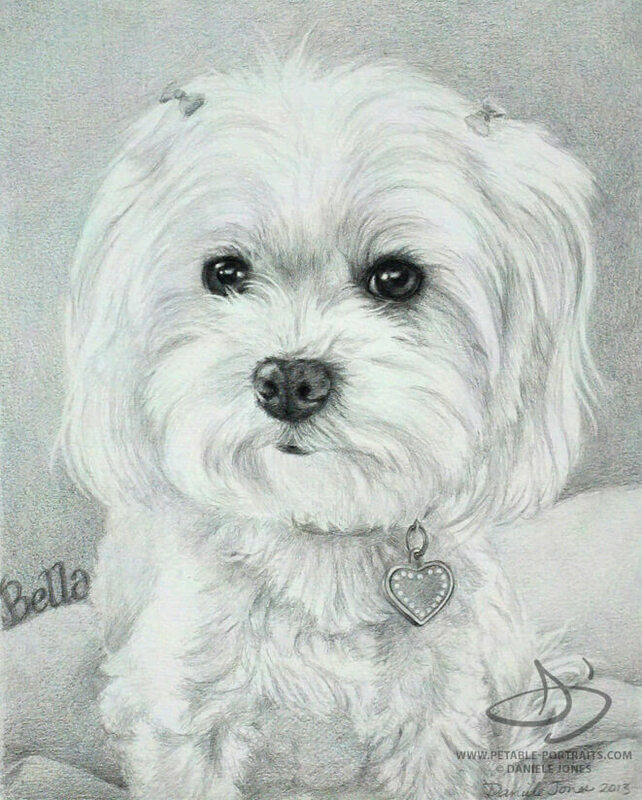 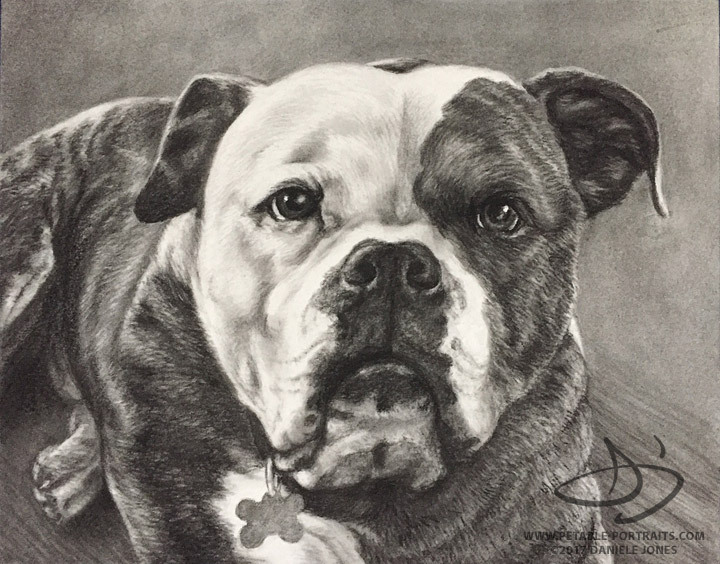 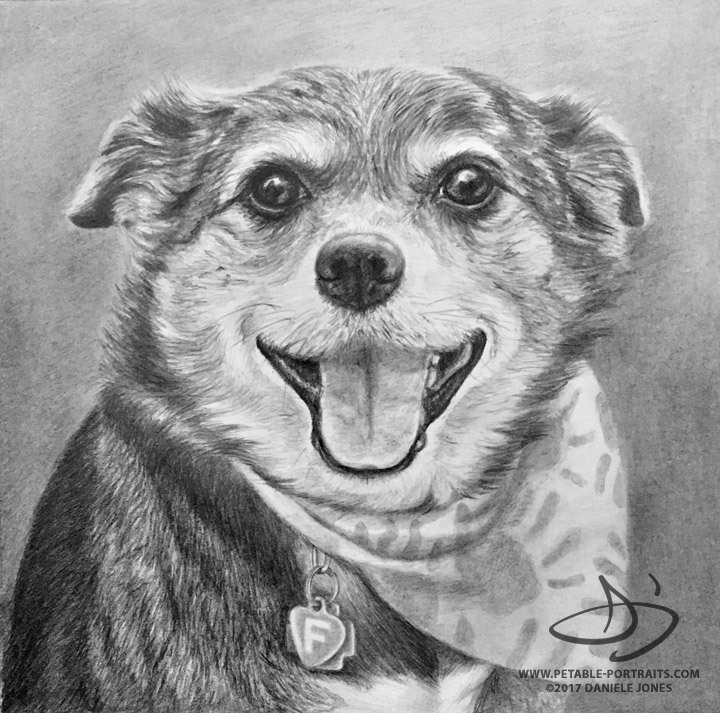 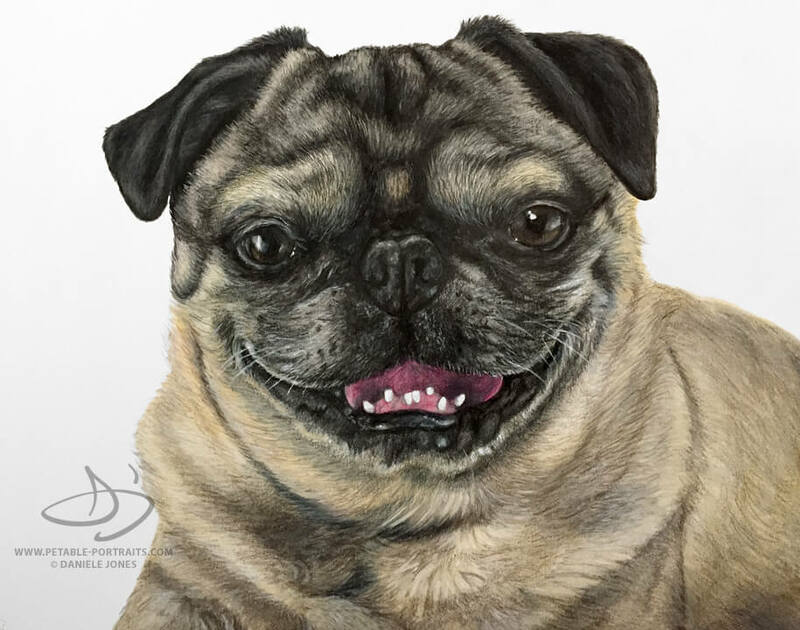 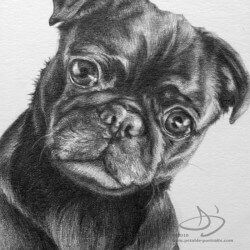 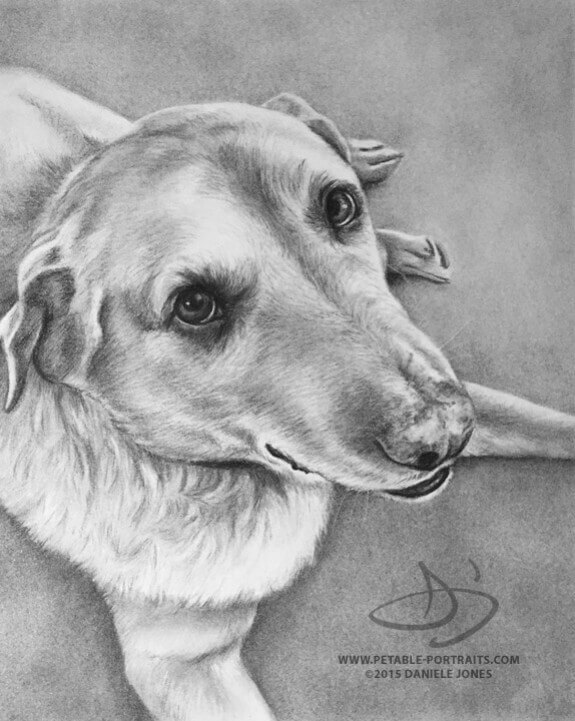 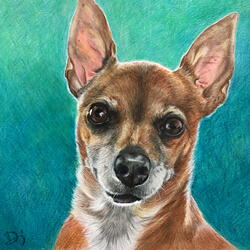 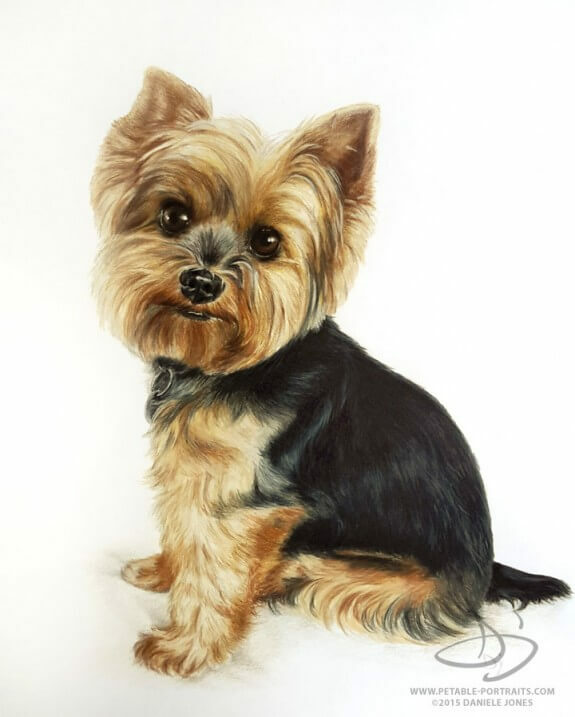 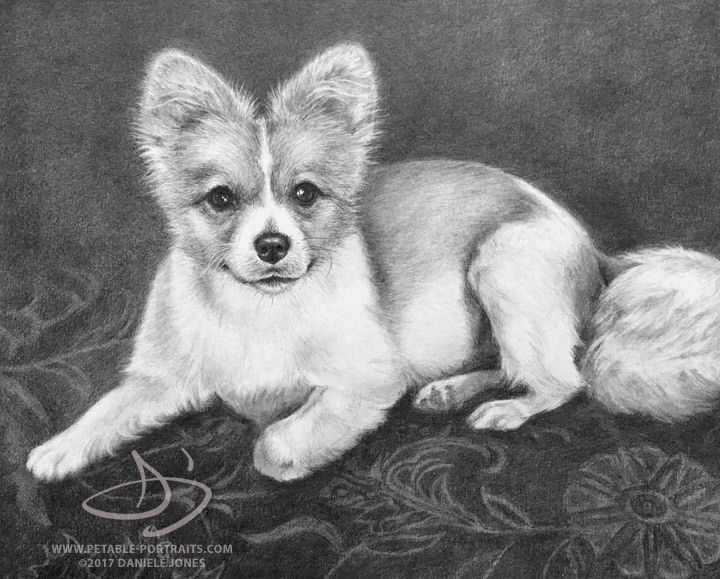 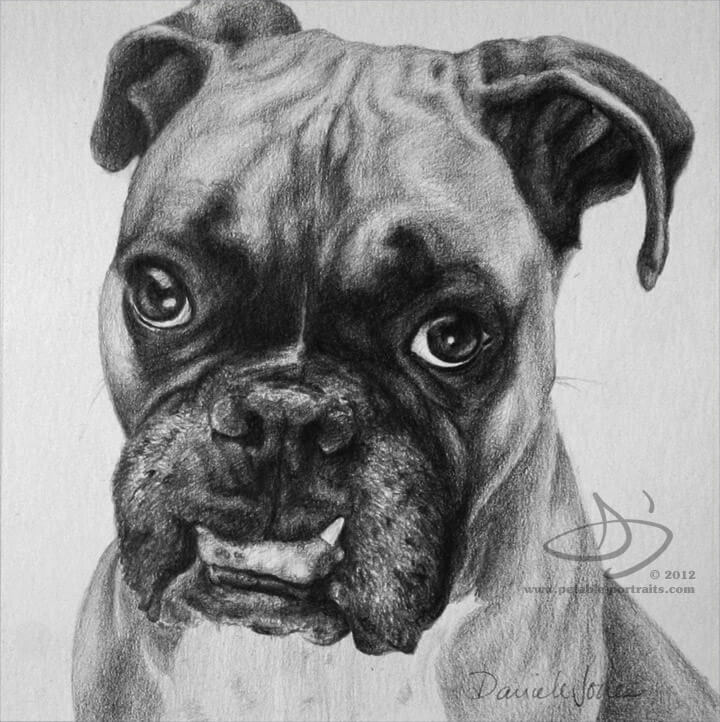 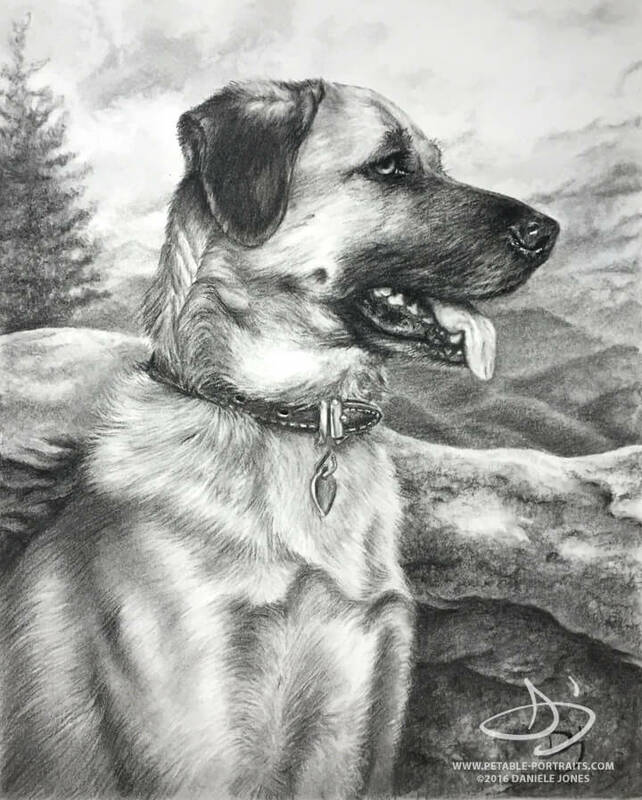 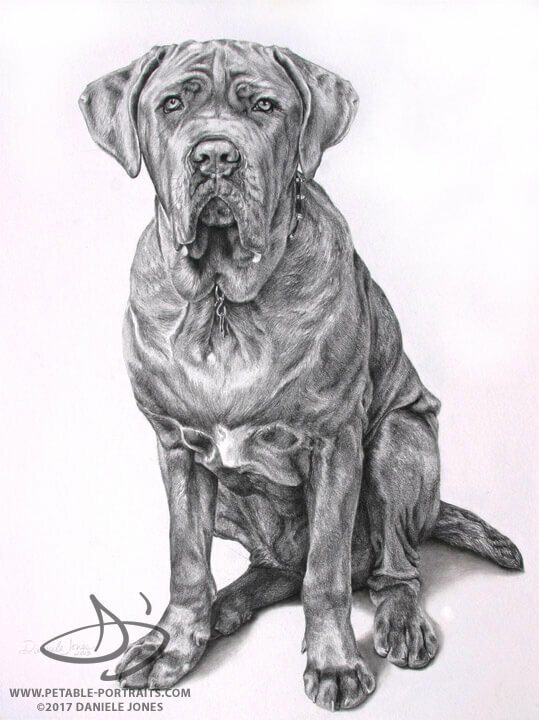 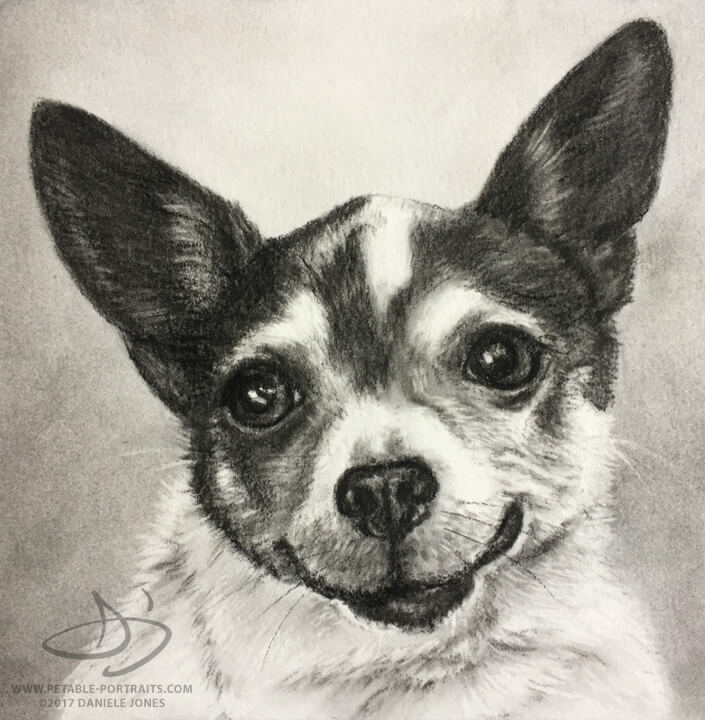 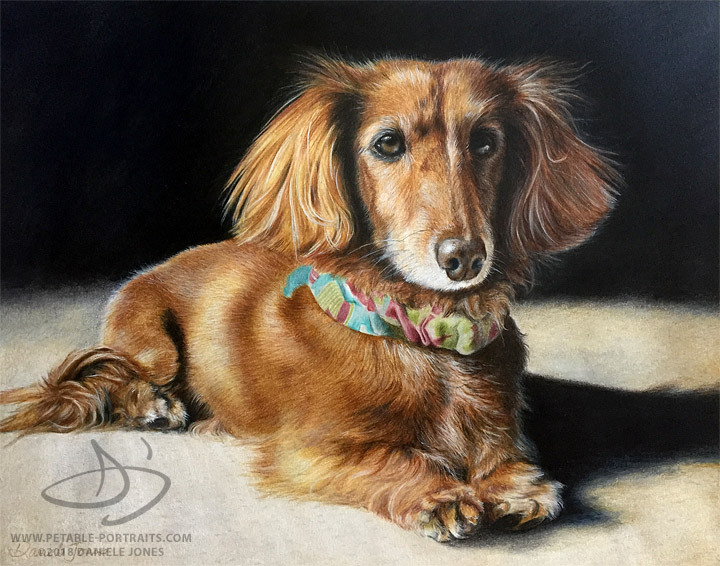 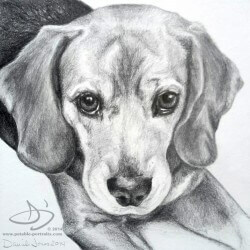 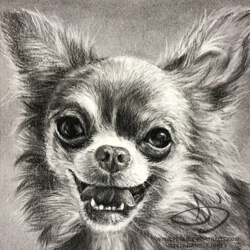 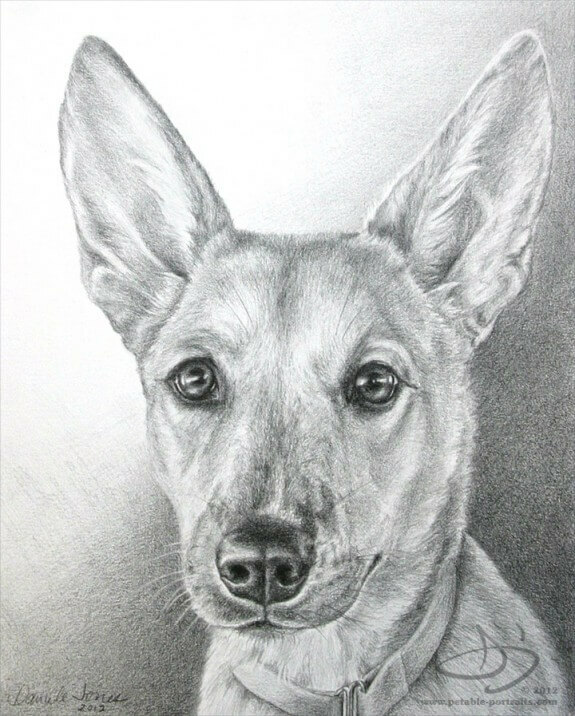 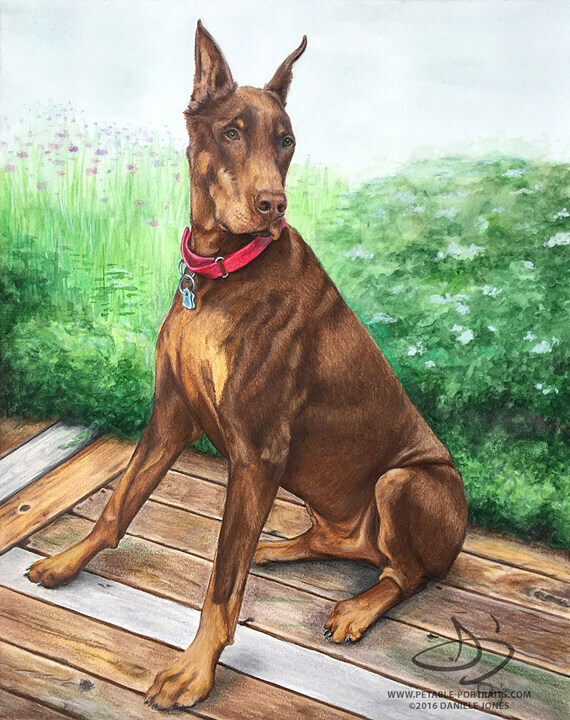 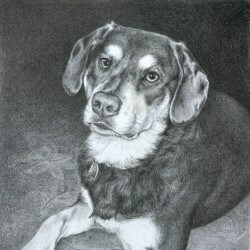 I can draw your dog portrait in any size. 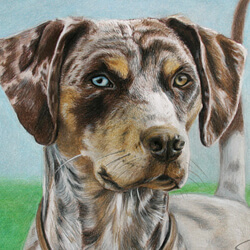 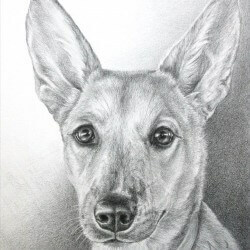 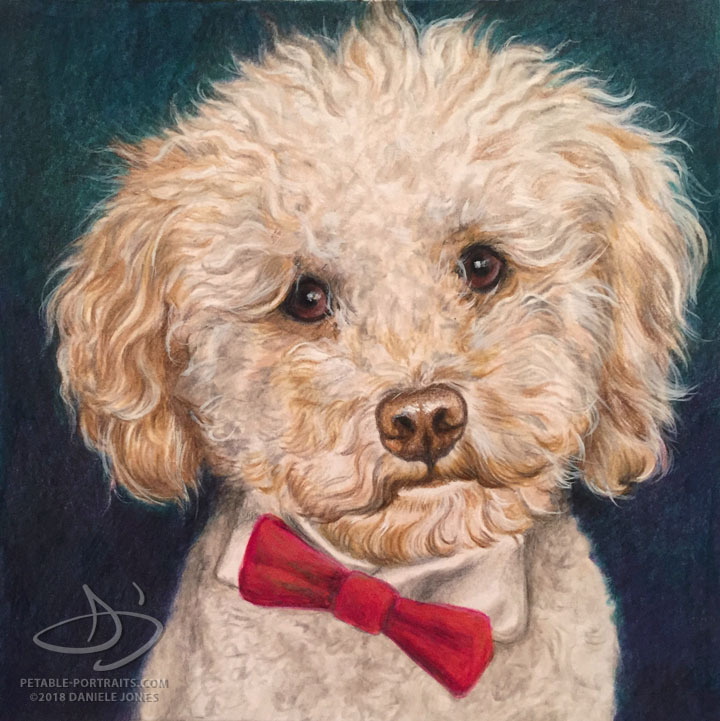 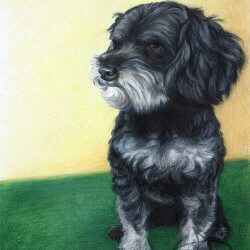 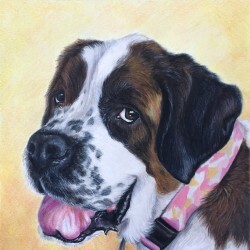 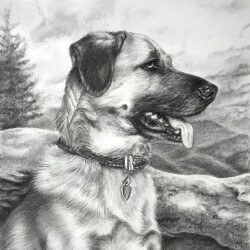 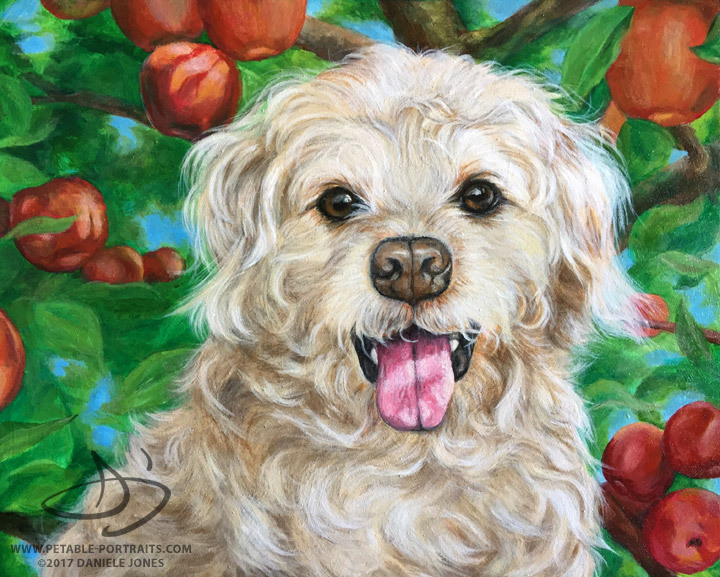 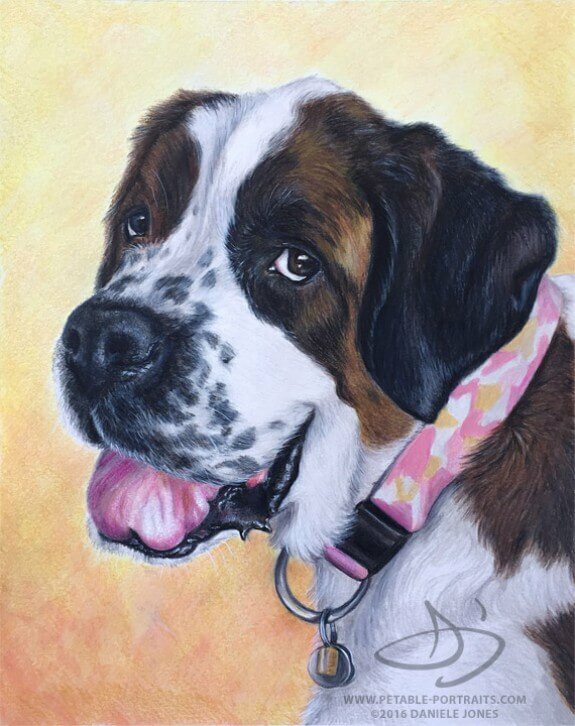 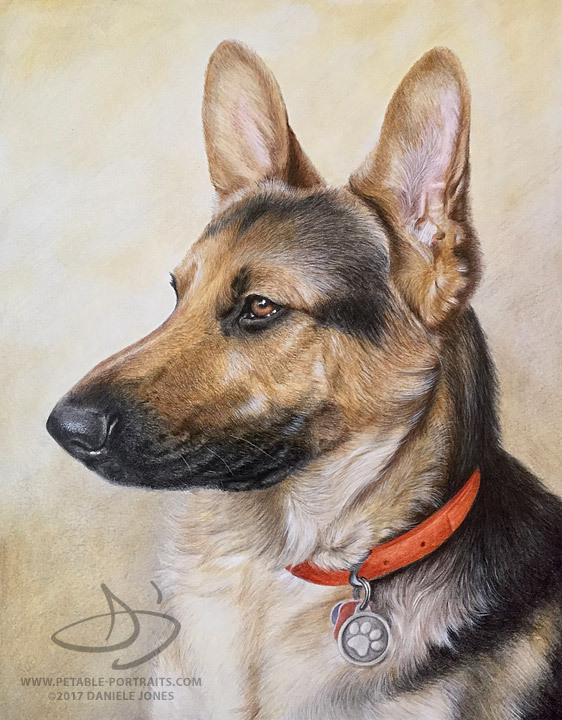 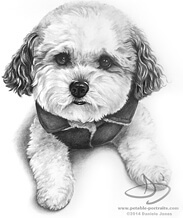 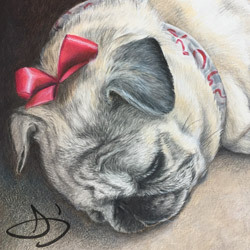 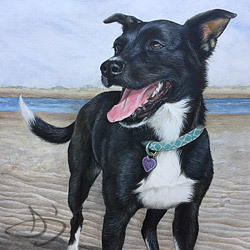 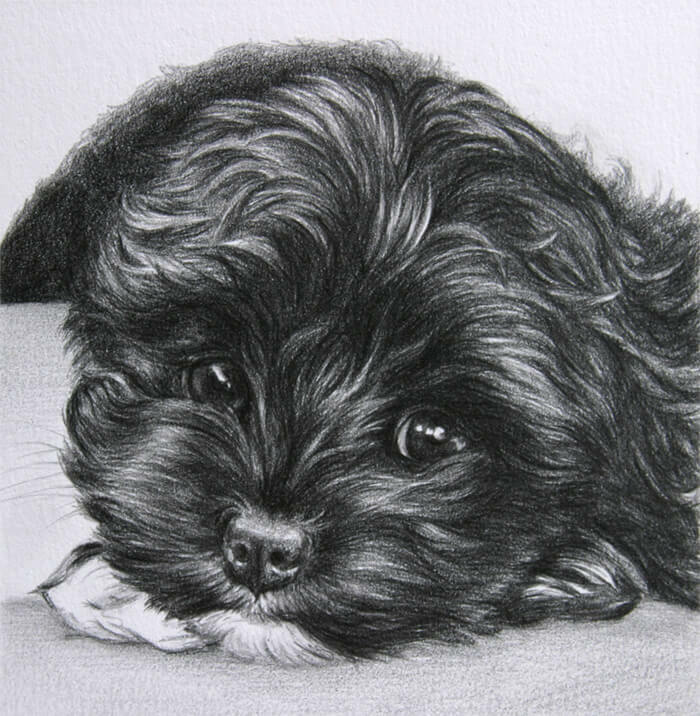 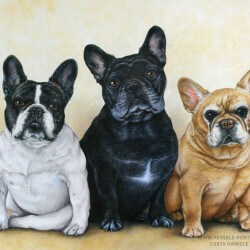 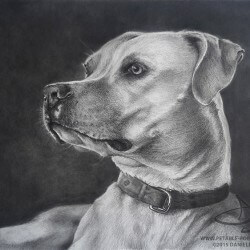 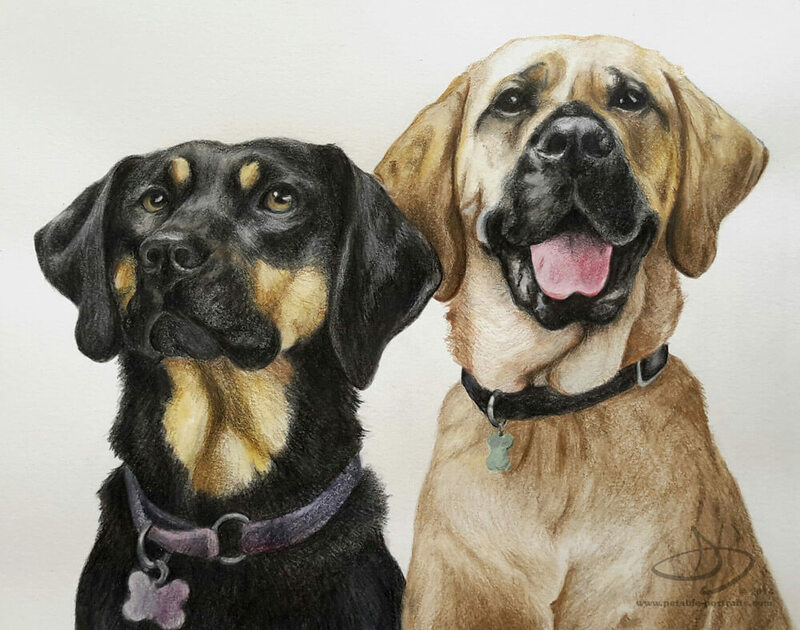 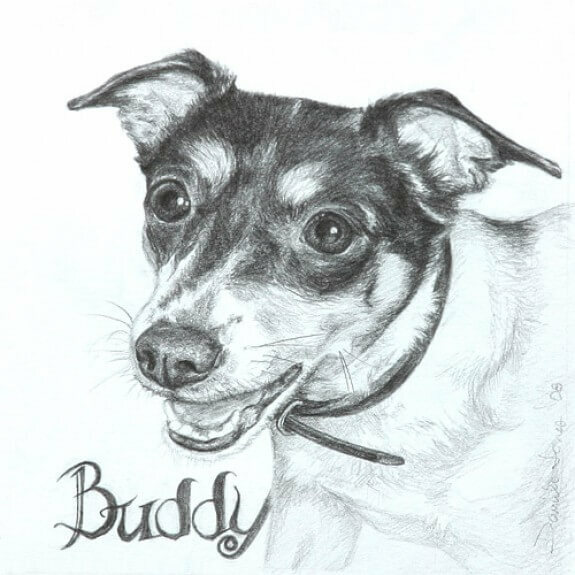 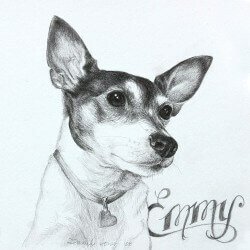 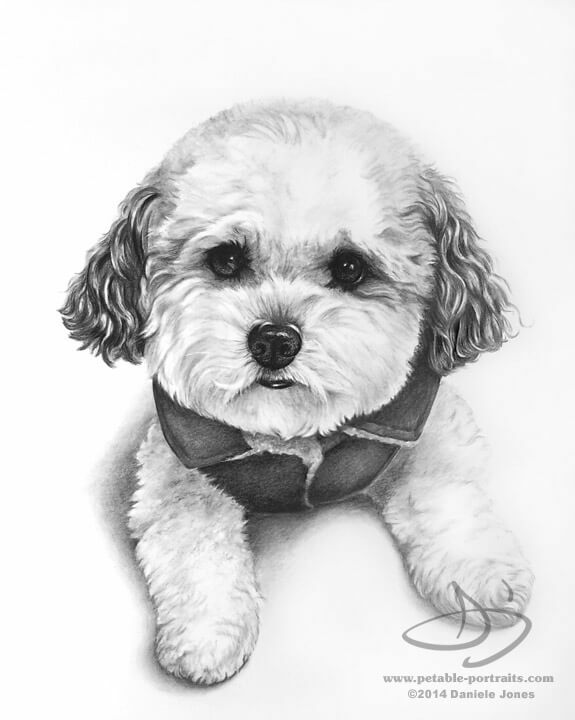 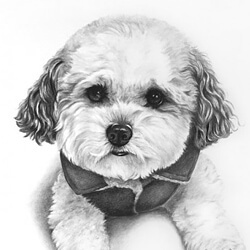 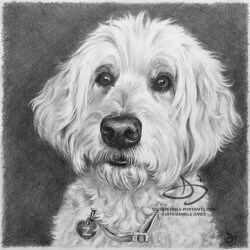 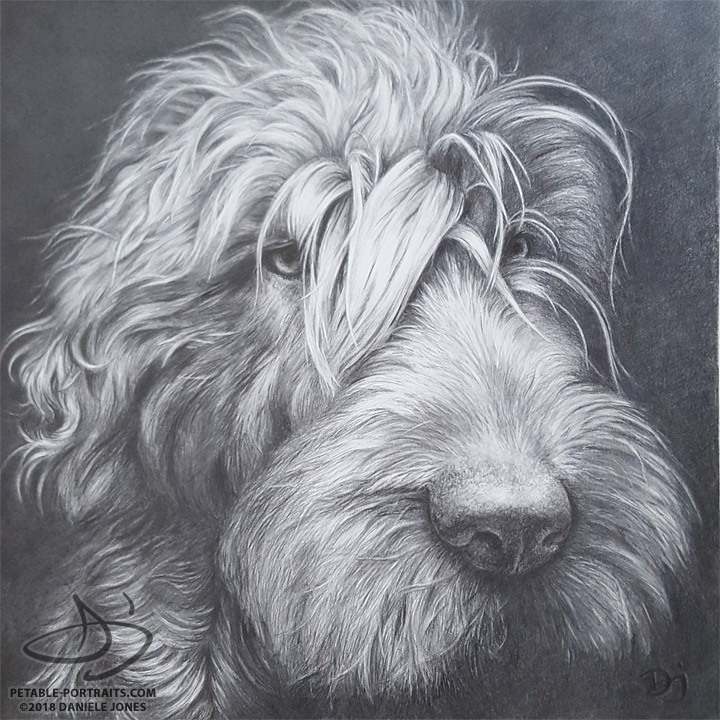 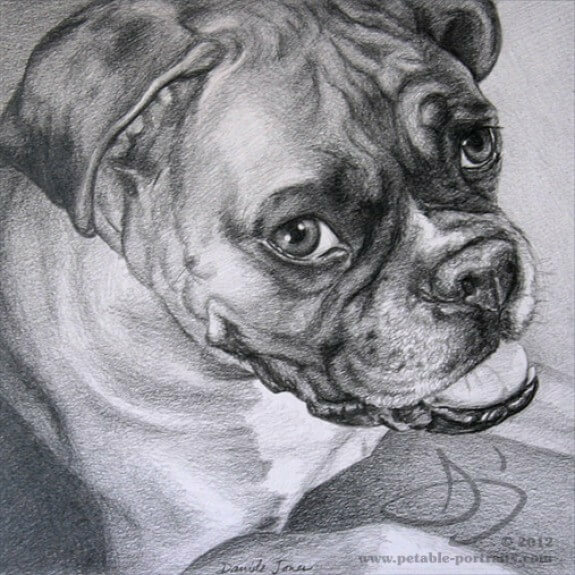 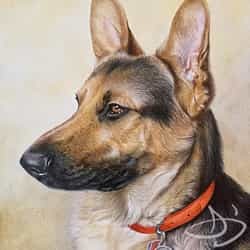 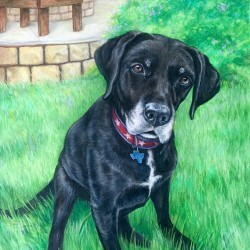 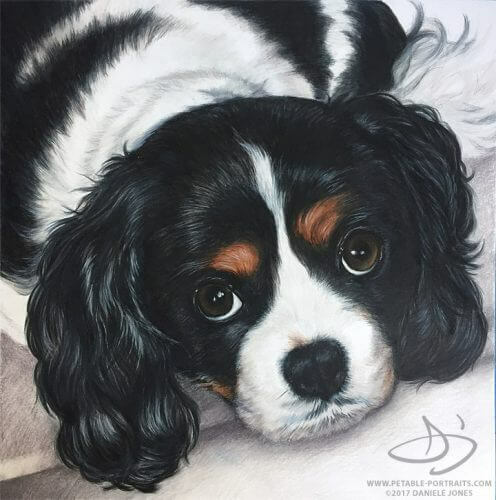 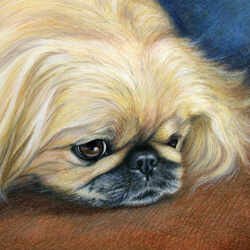 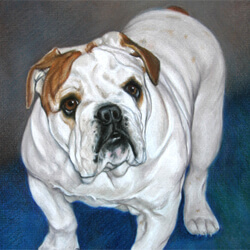 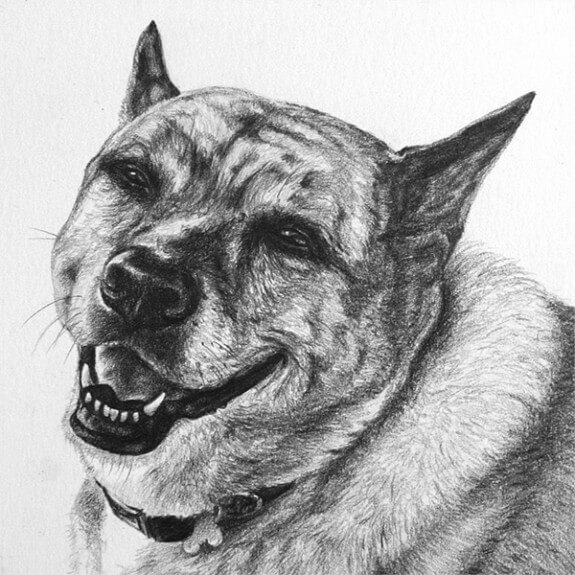 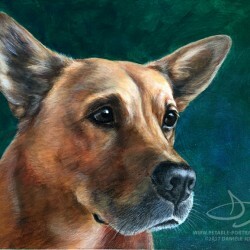 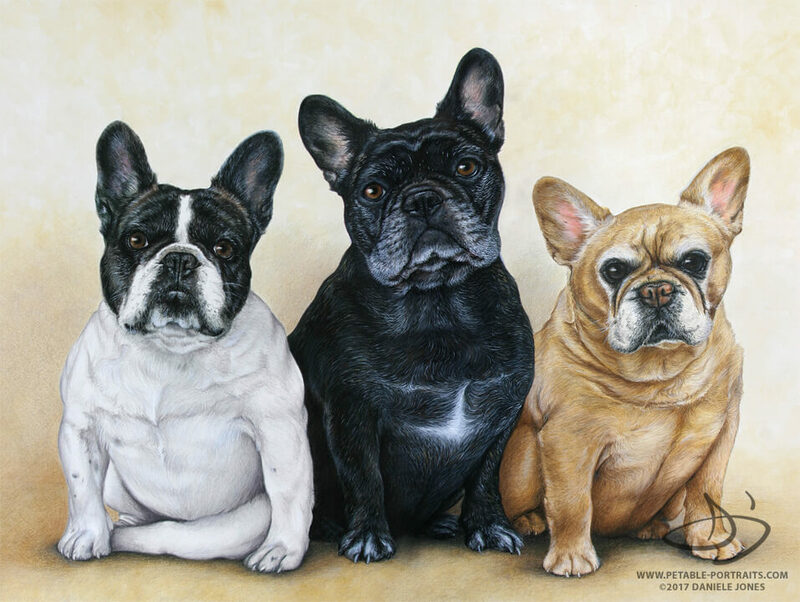 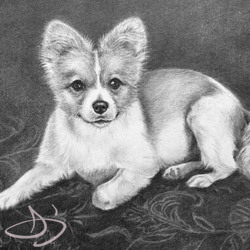 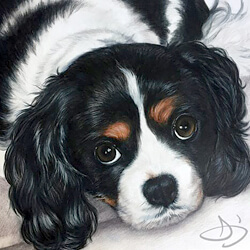 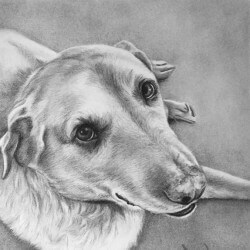 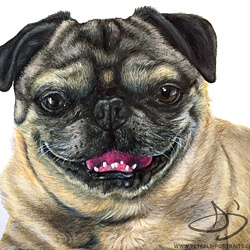 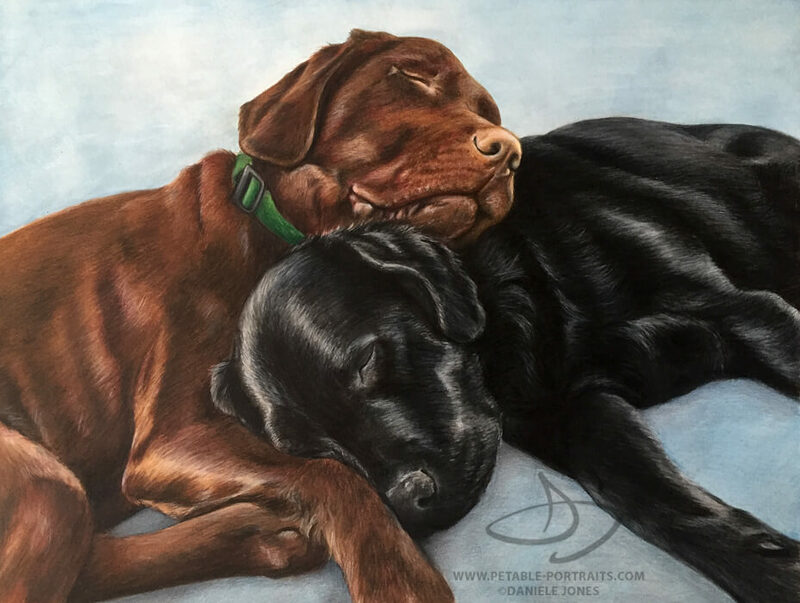 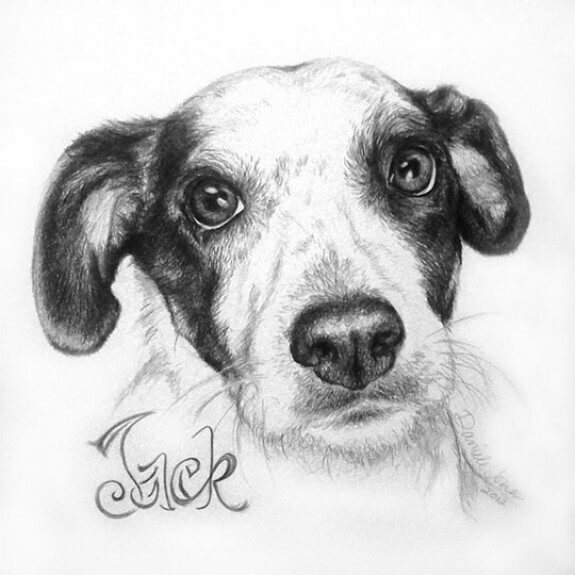 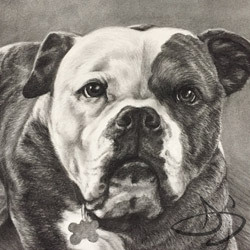 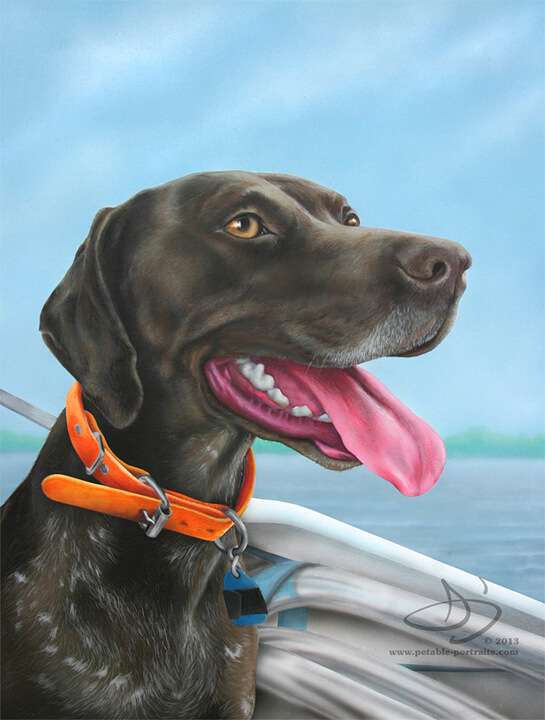 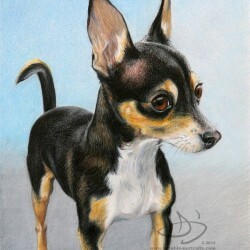 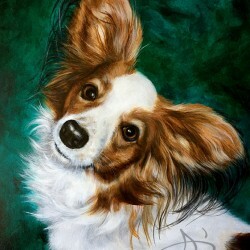 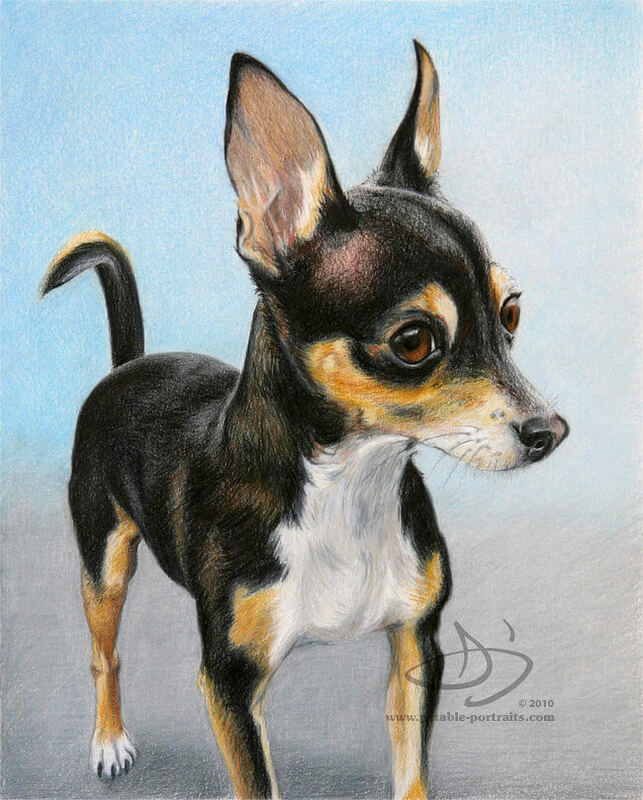 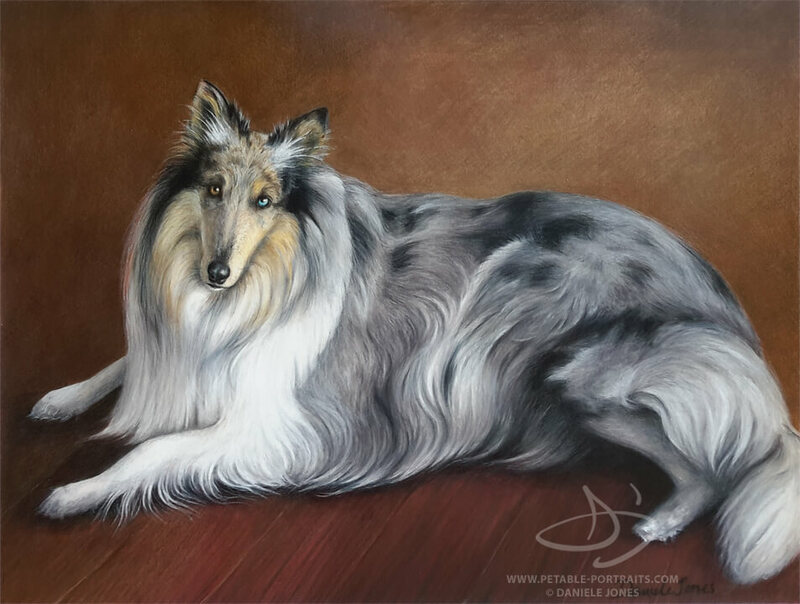 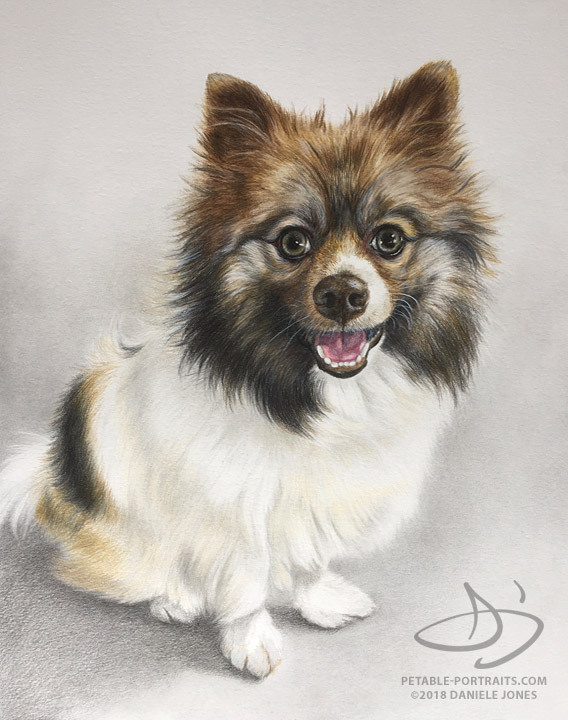 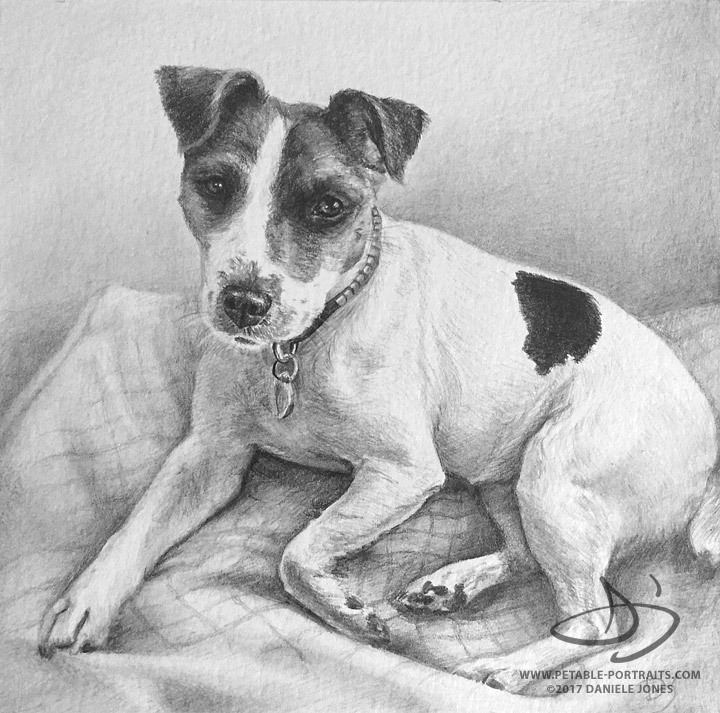 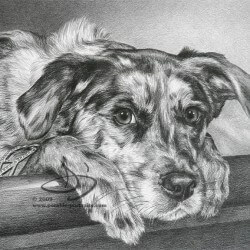 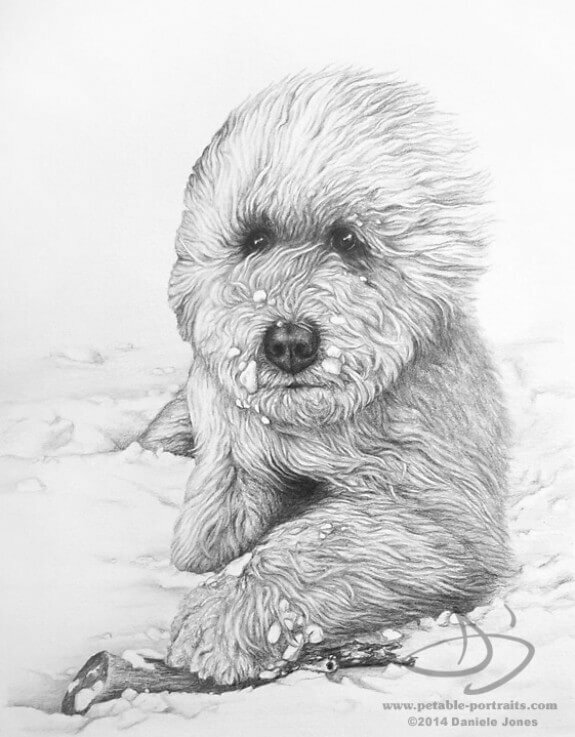 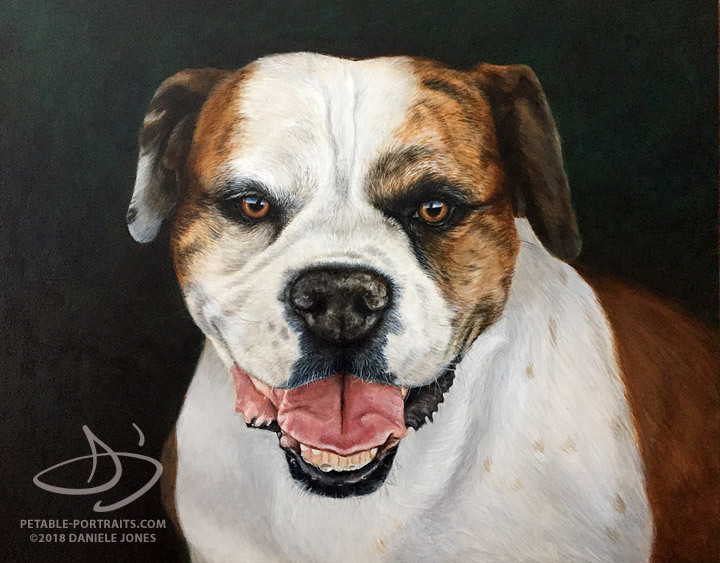 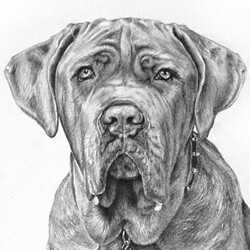 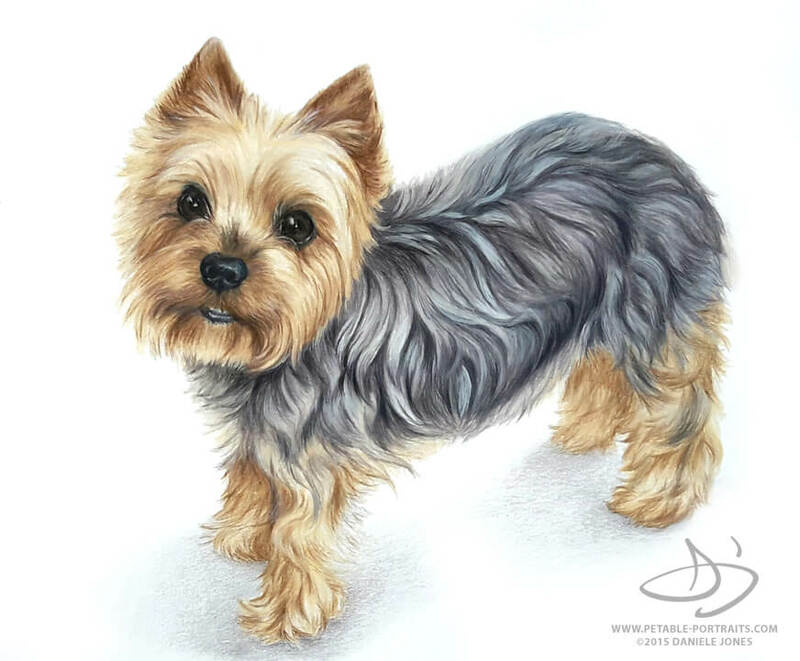 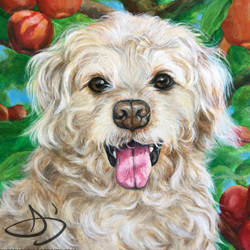 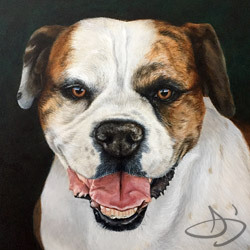 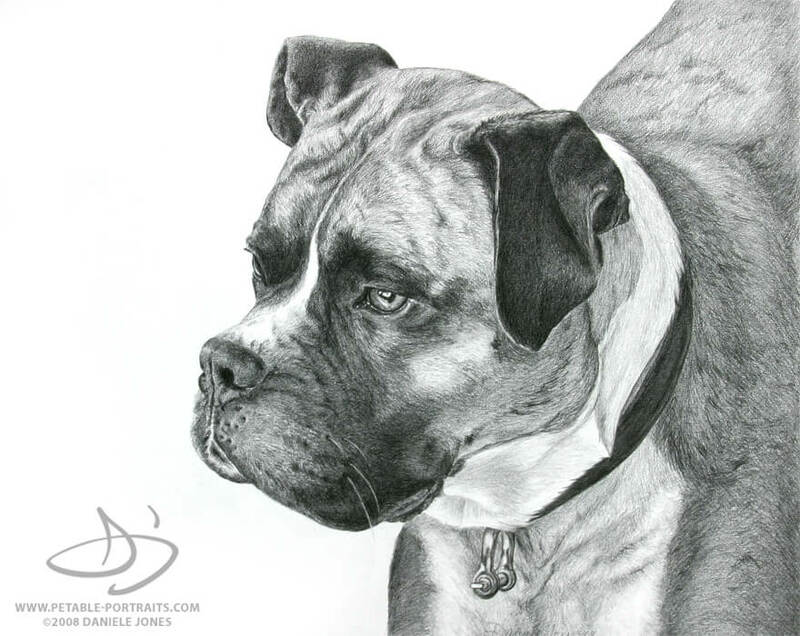 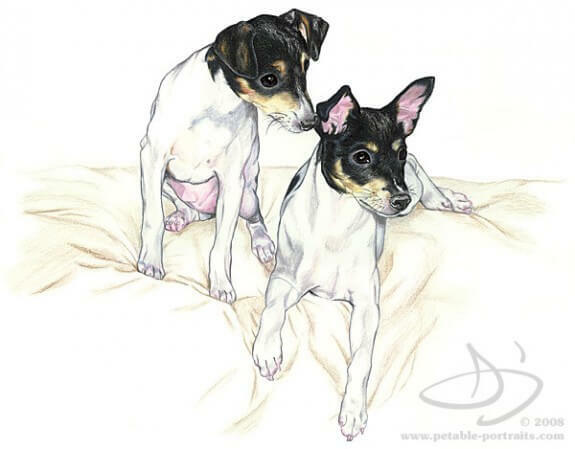 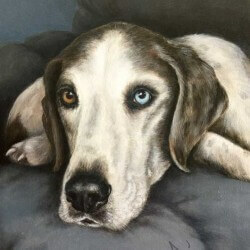 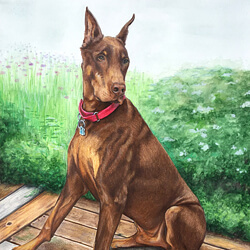 The most popular sizes are listed on the Order a Pet Portrait page. 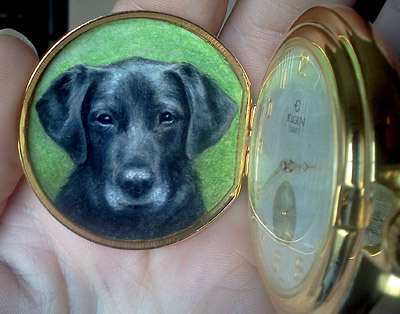 If you'd like a custom size or have any unusual ideas, I want to hear them! 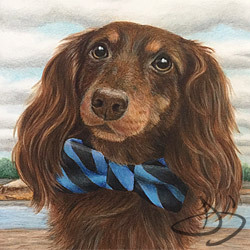 Email me. 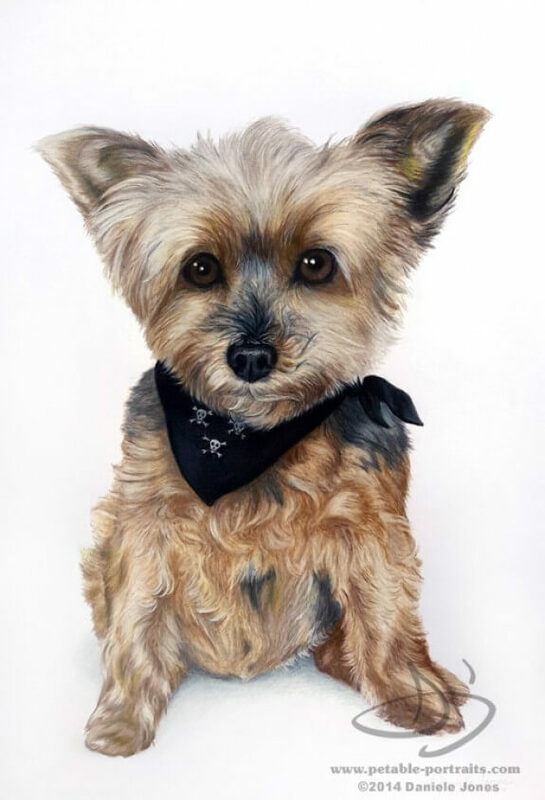 I work from your photos, send me as many as you'd like. 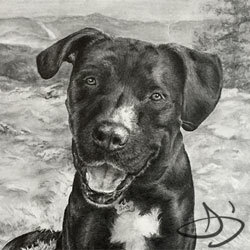 If you have time tell, me some stories. 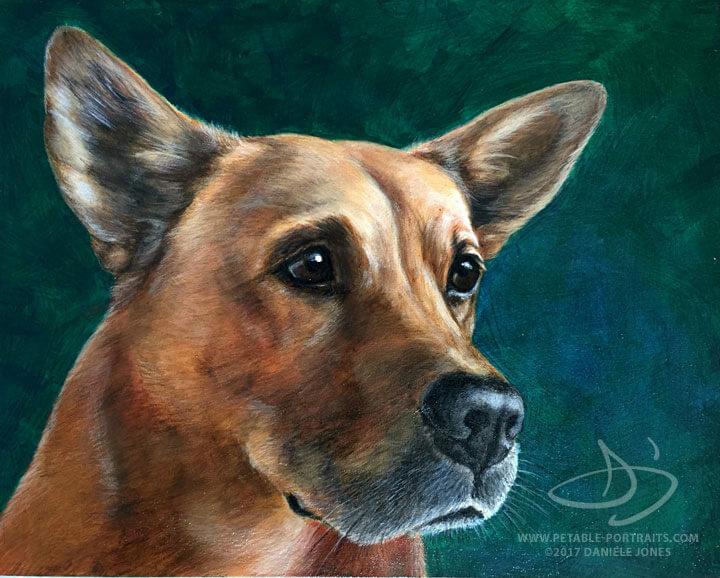 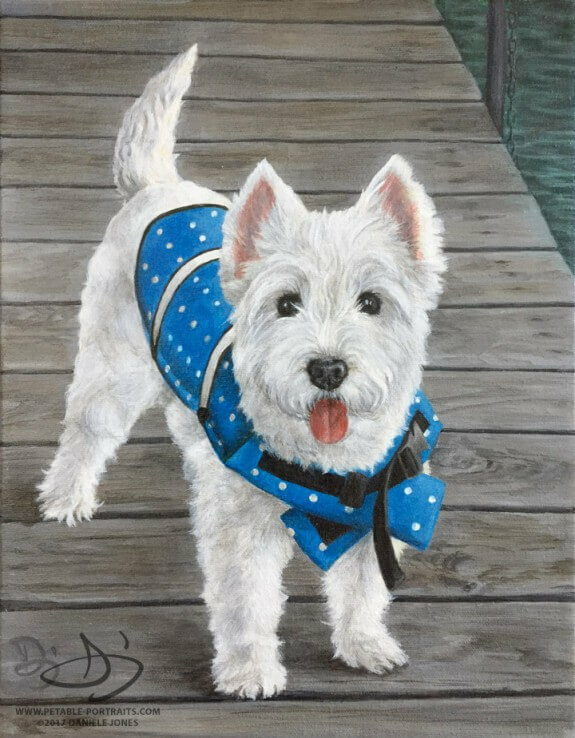 When I hear the love people have for their furry buddies, I'm always touched, and knowing more about their personality enhances the portrait. 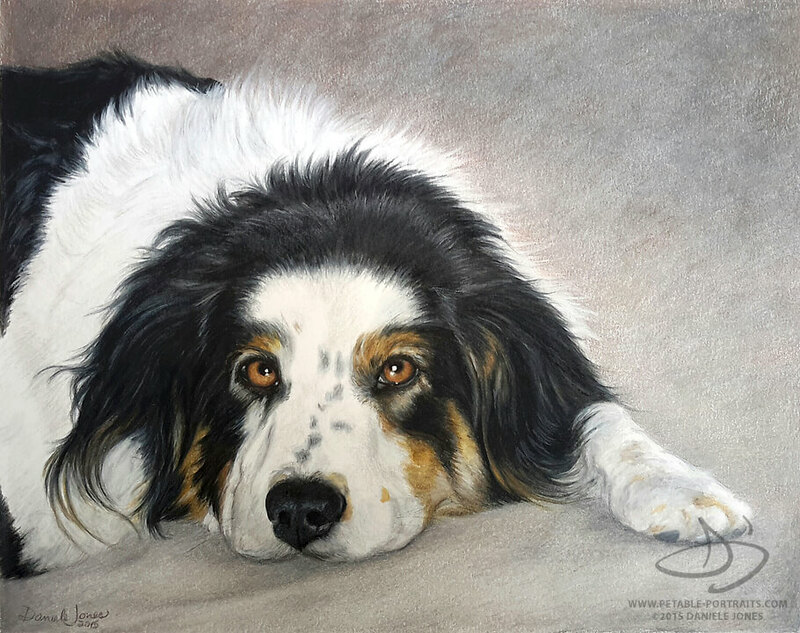 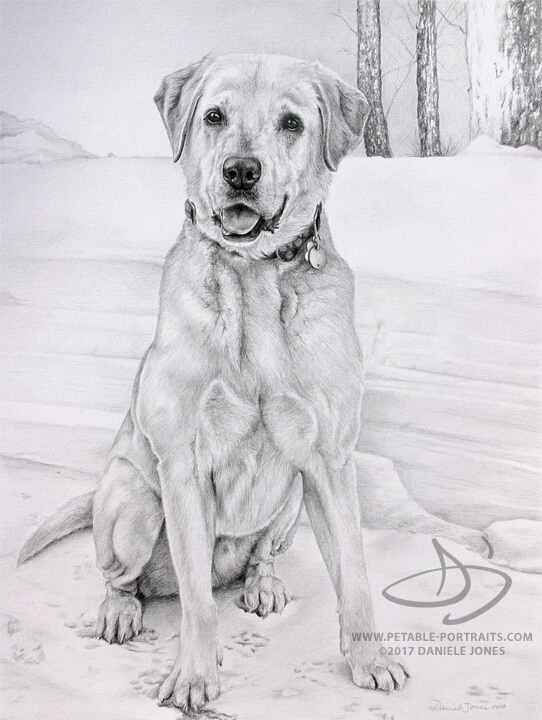 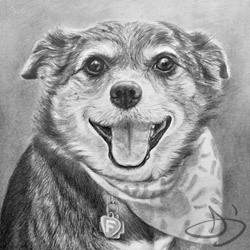 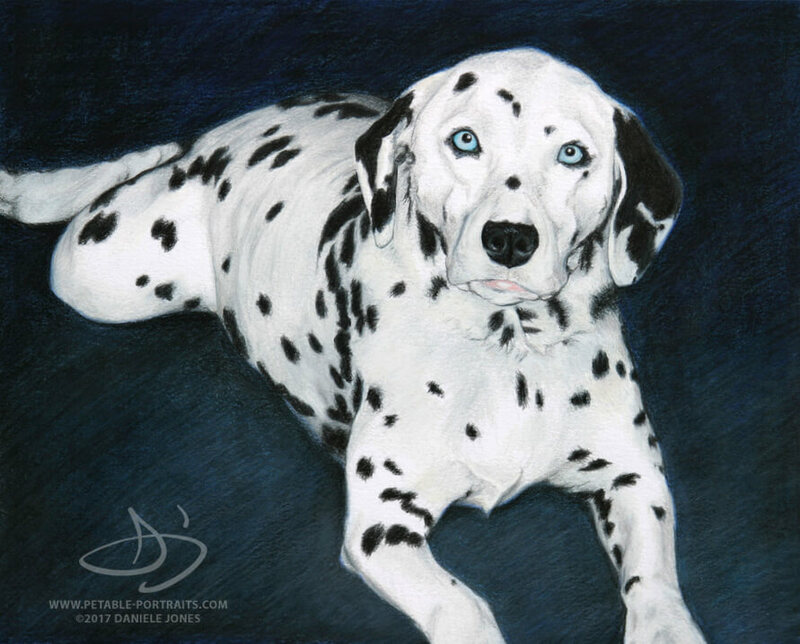 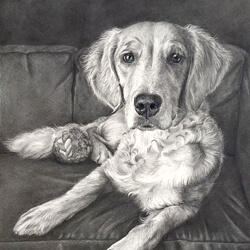 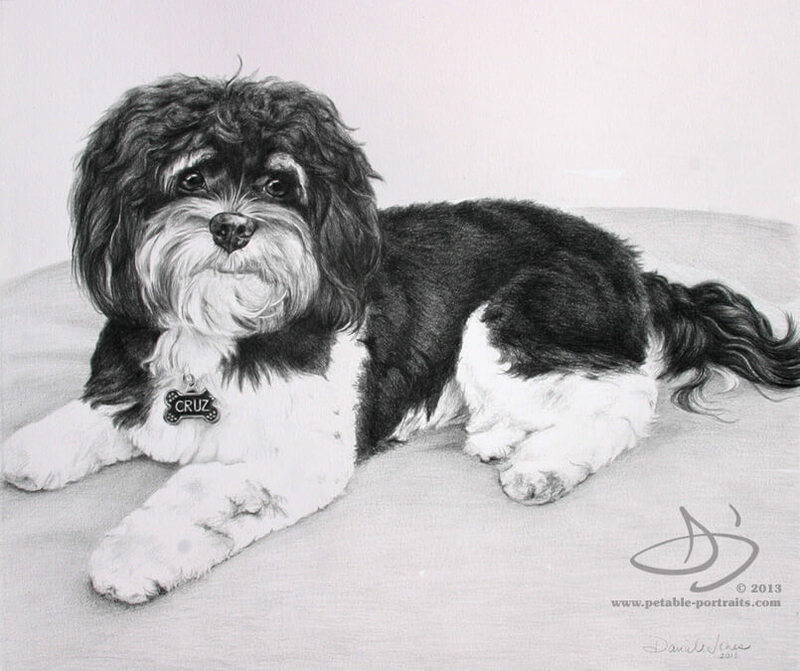 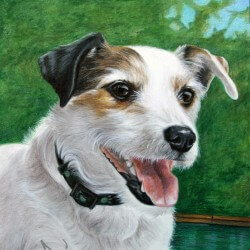 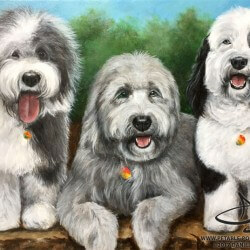 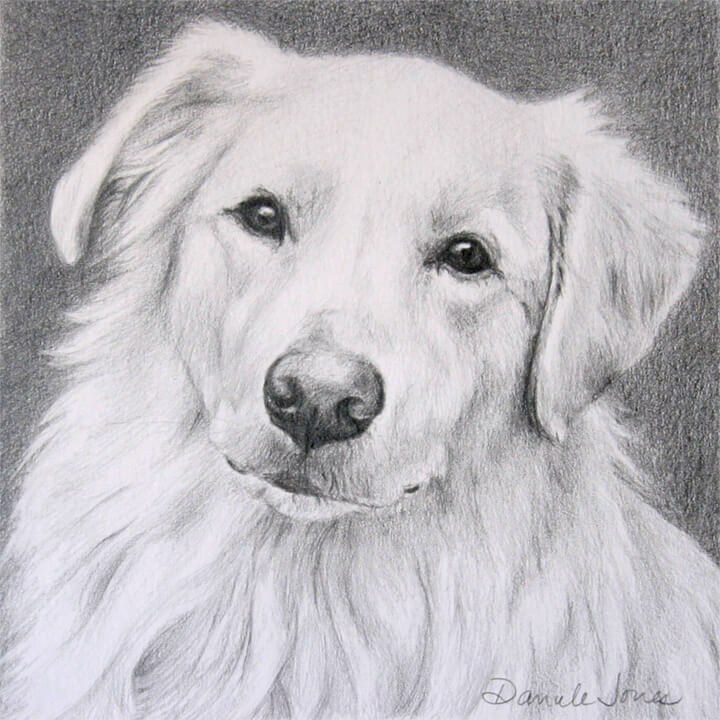 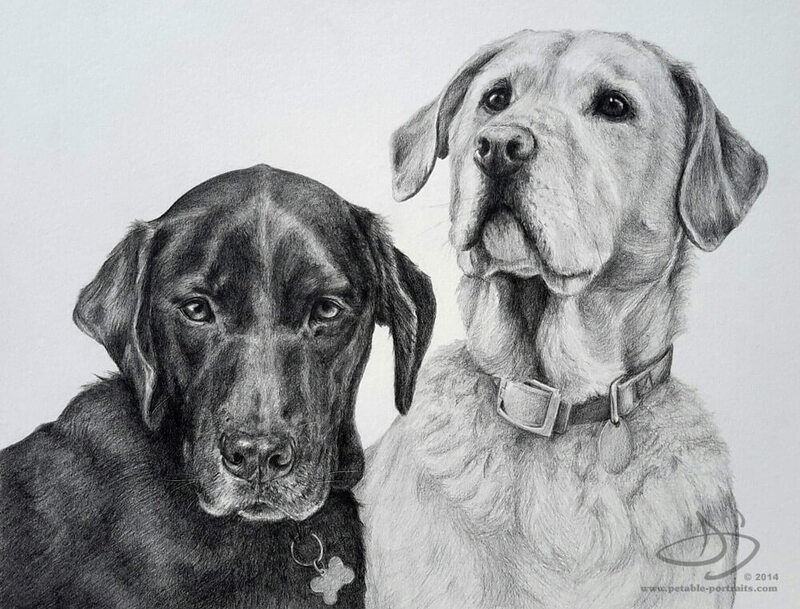 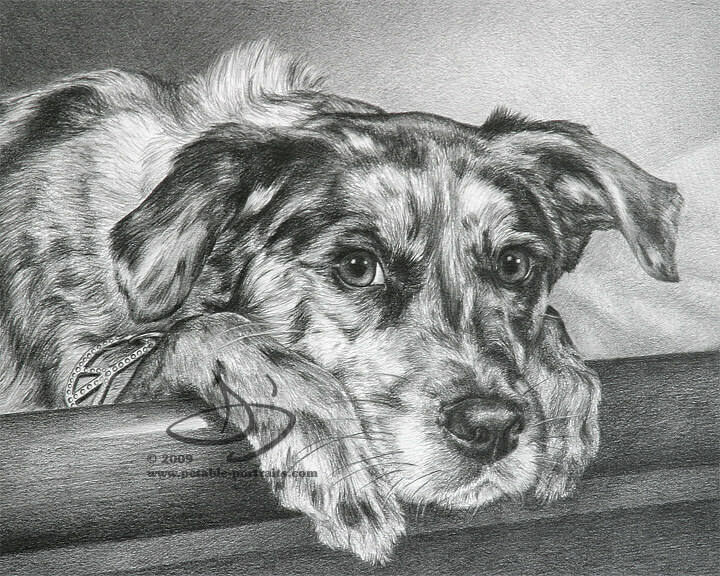 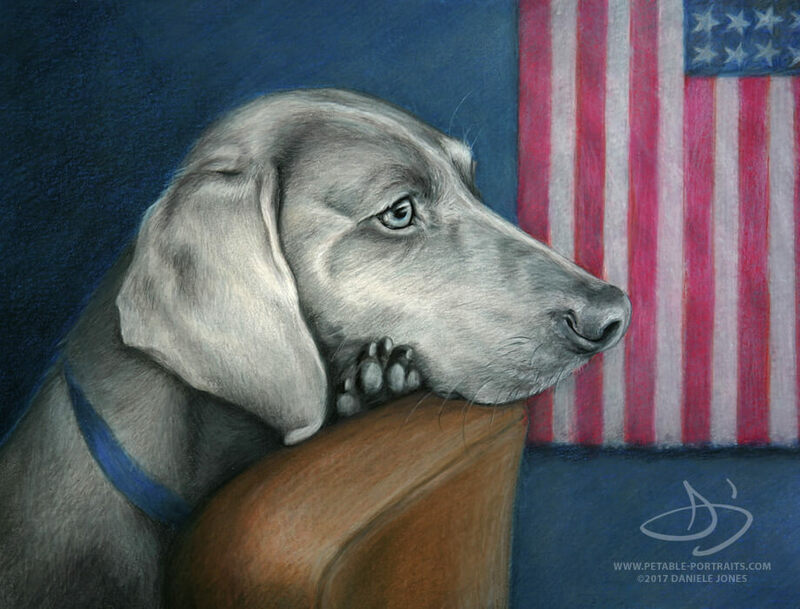 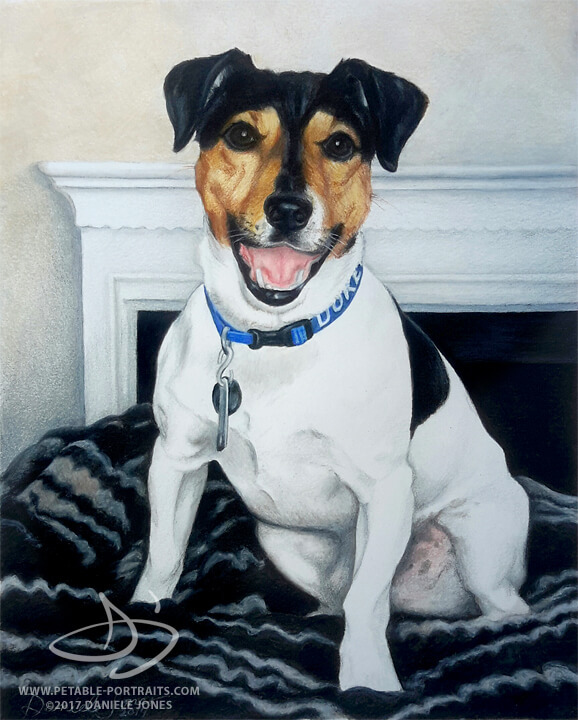 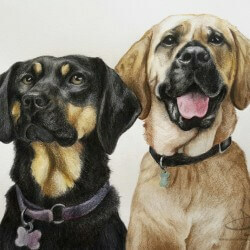 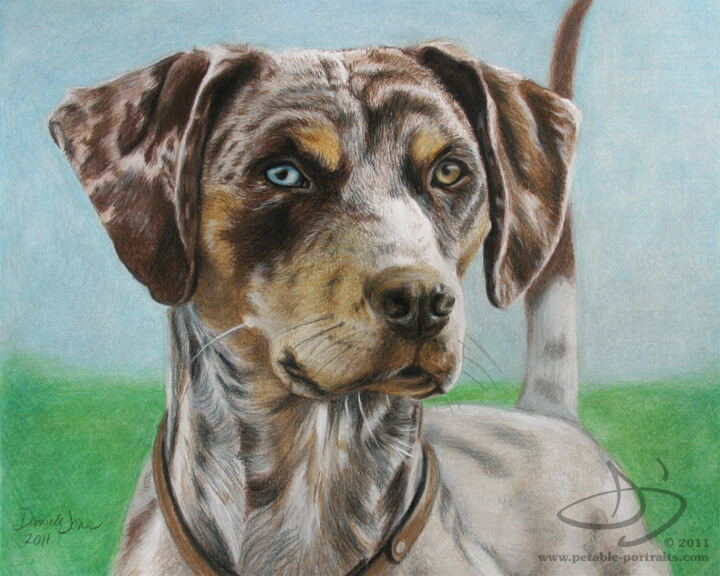 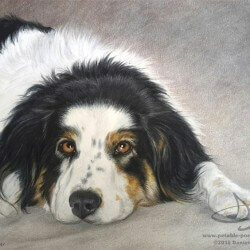 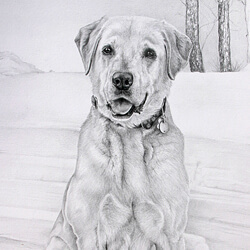 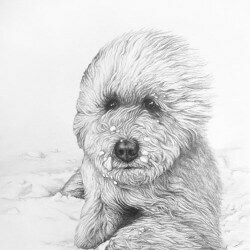 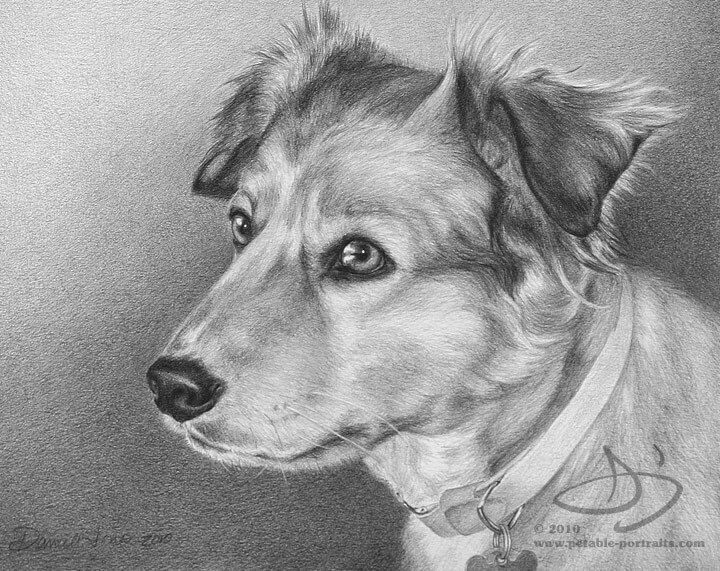 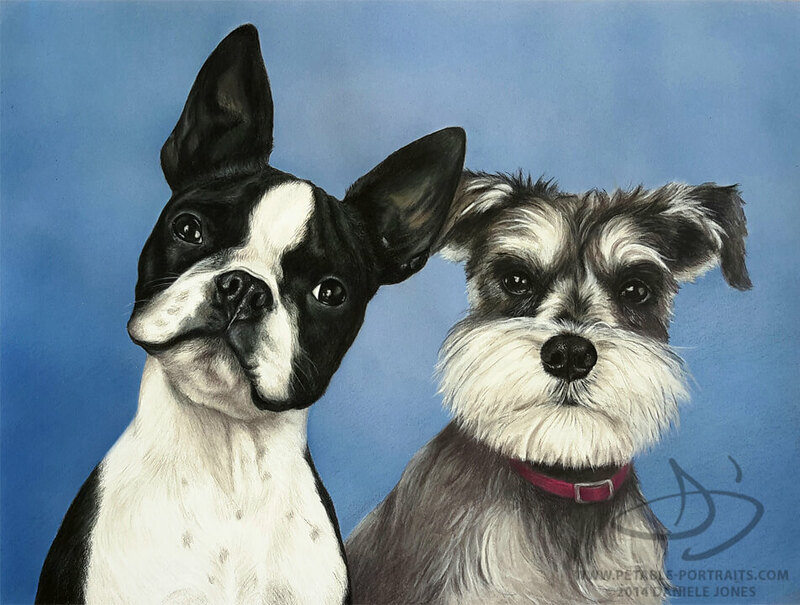 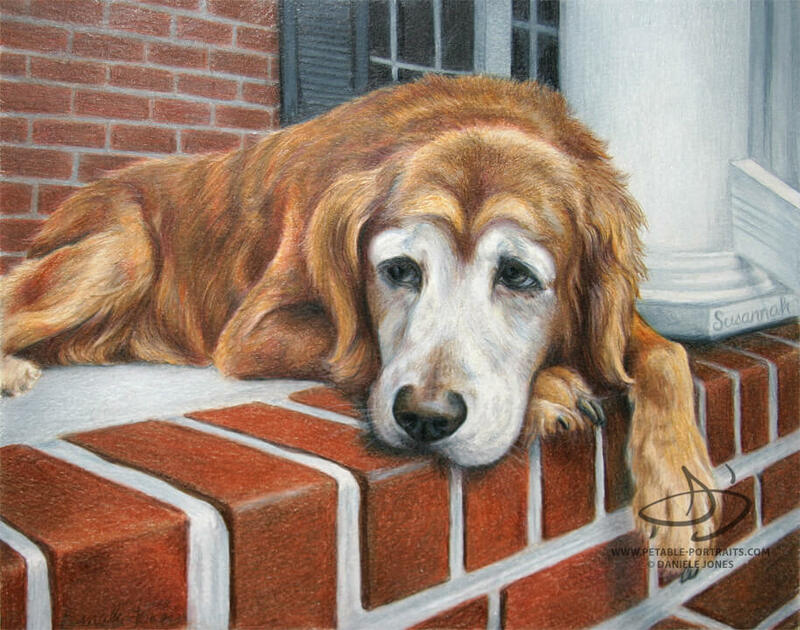 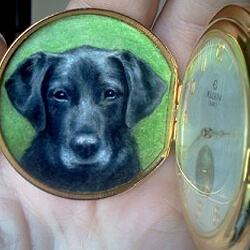 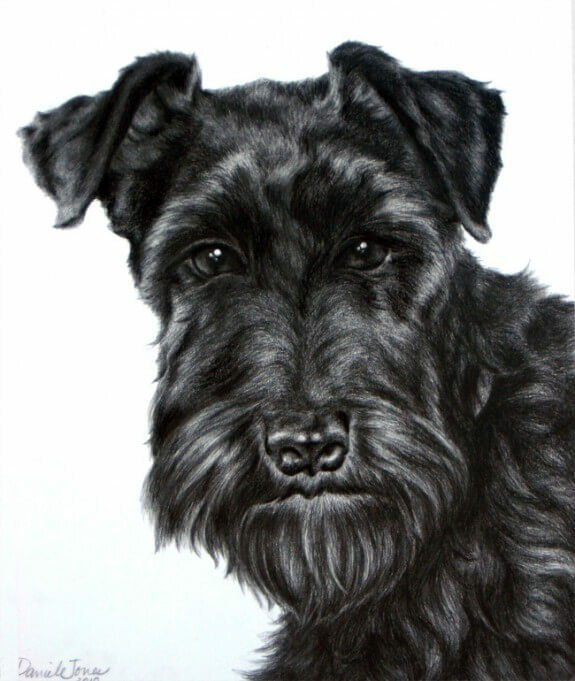 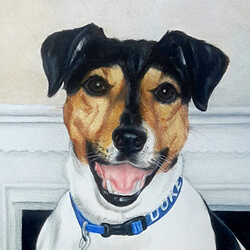 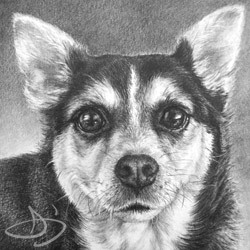 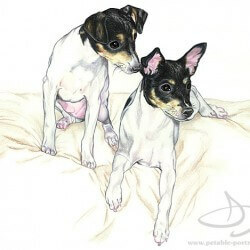 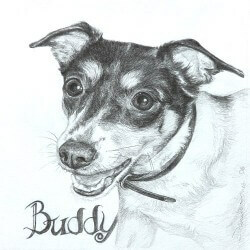 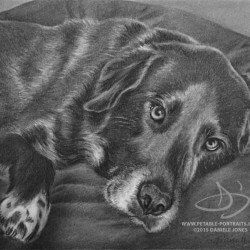 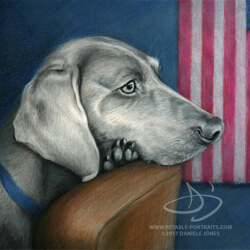 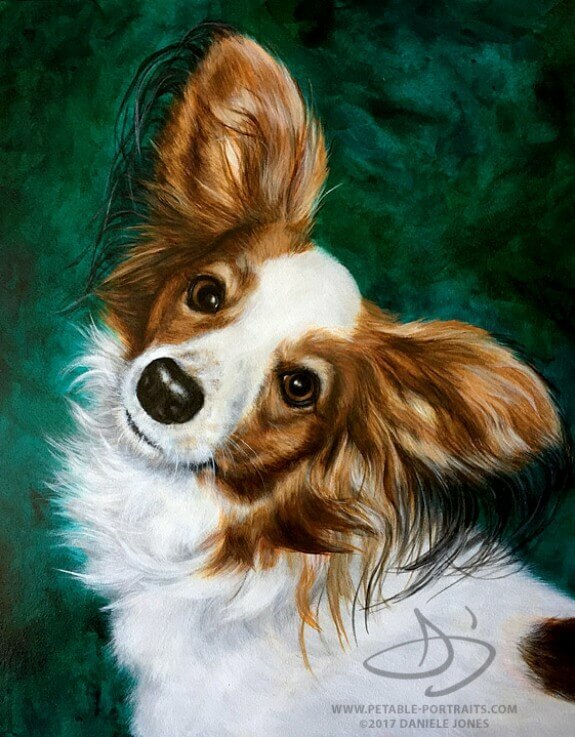 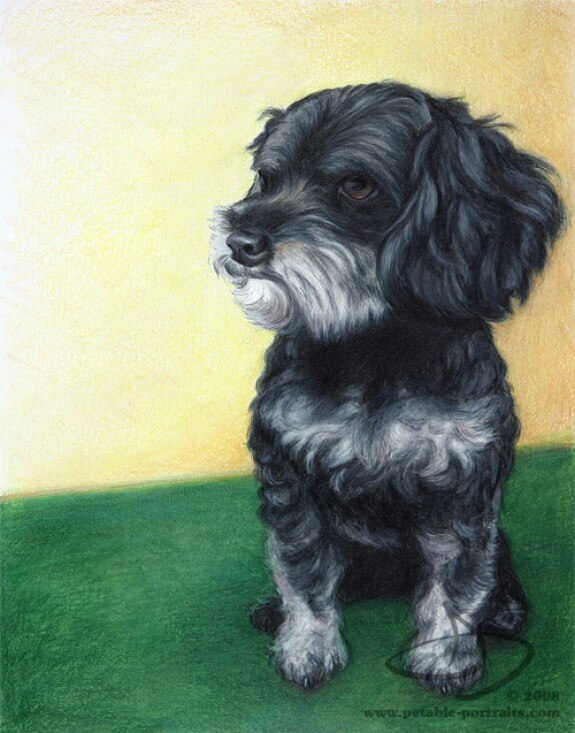 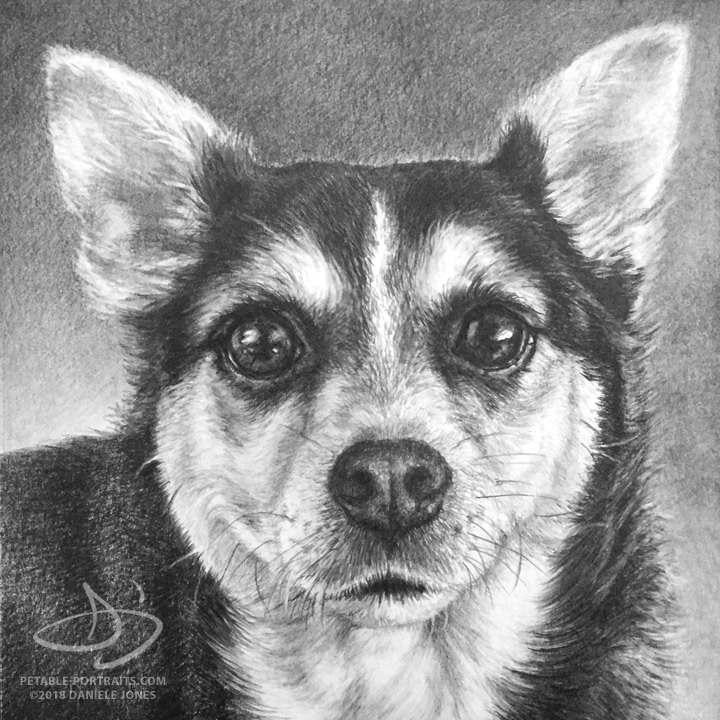 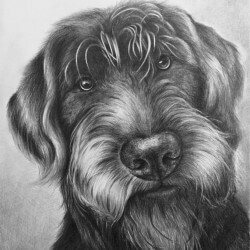 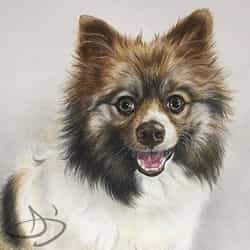 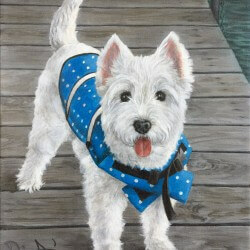 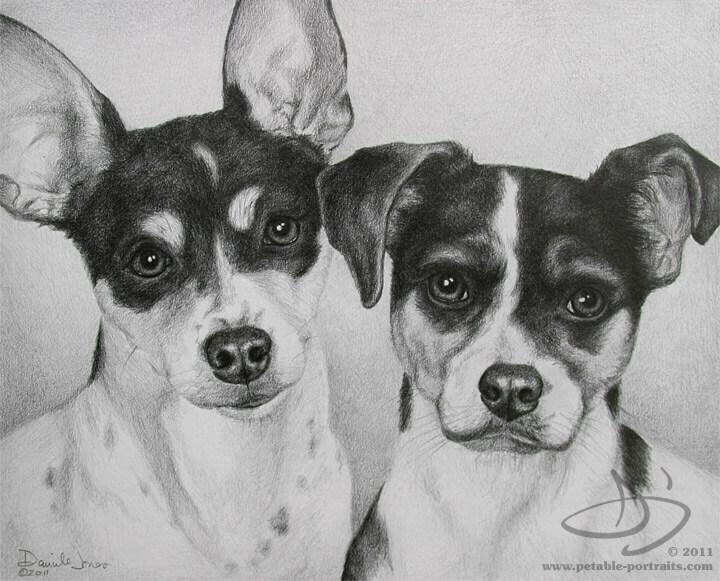 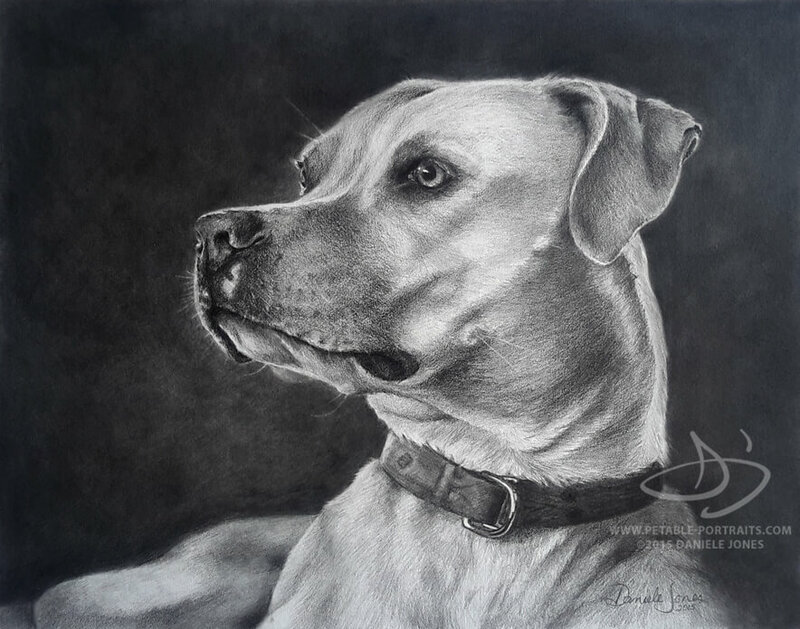 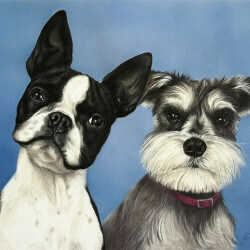 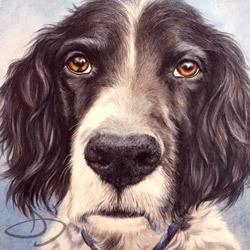 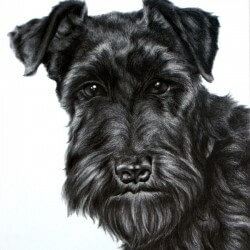 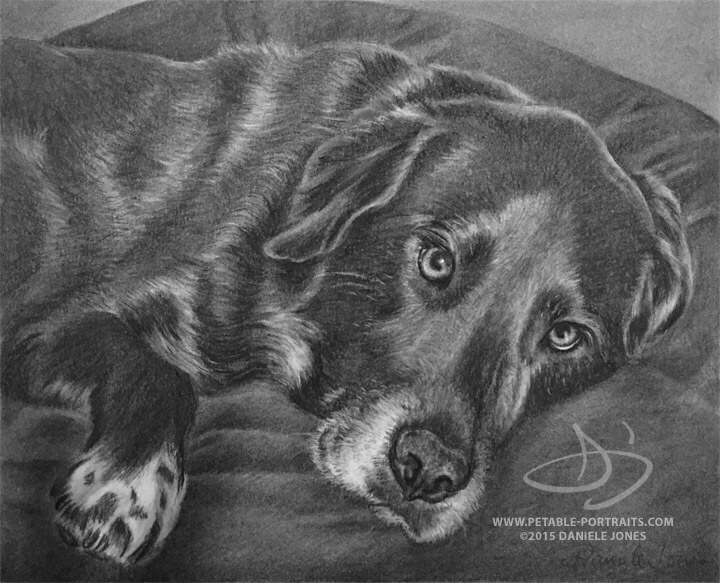 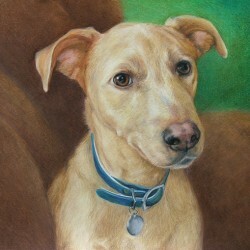 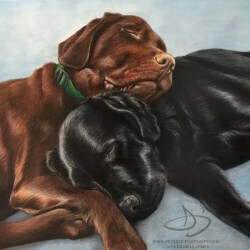 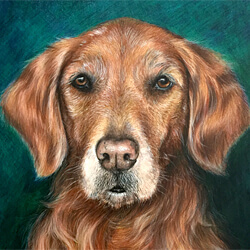 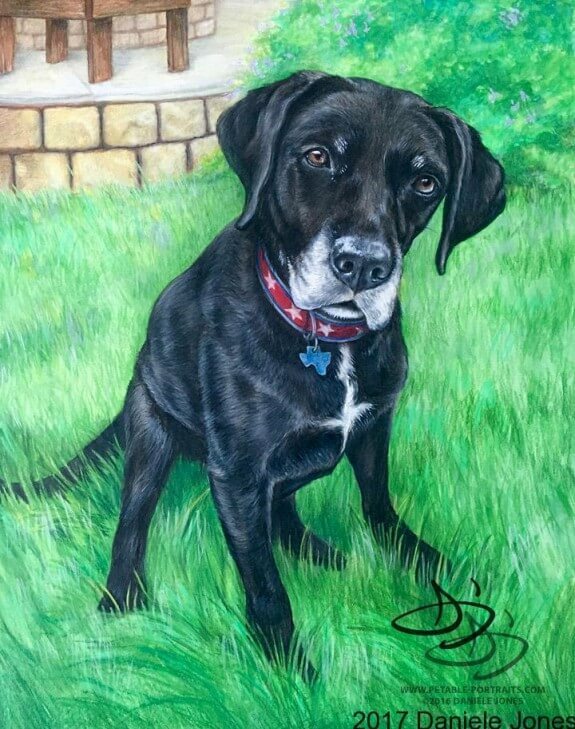 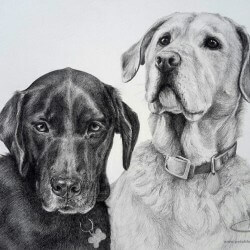 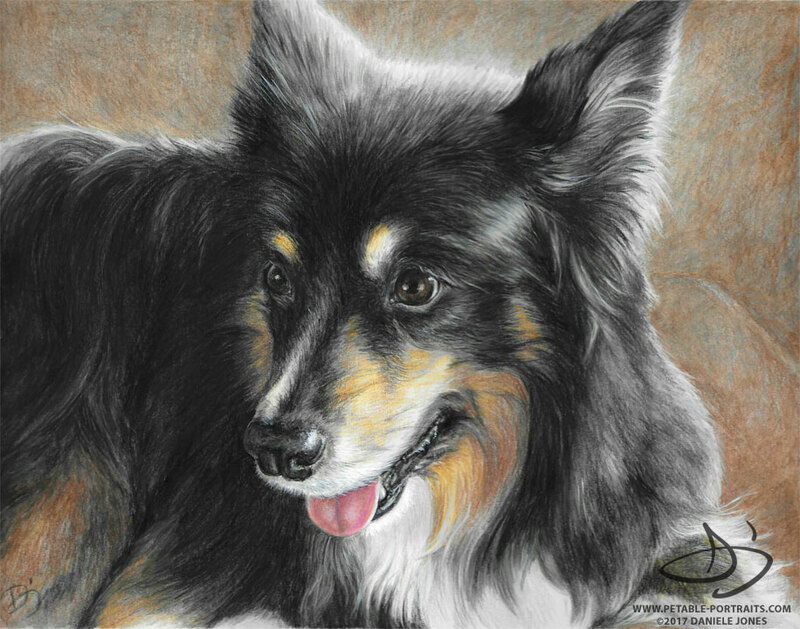 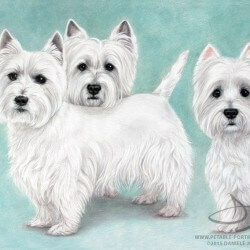 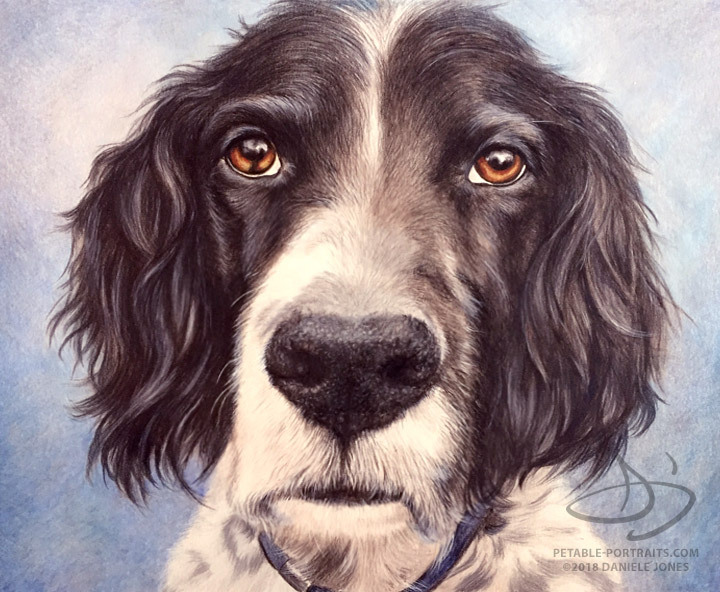 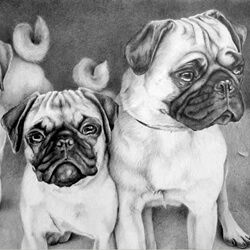 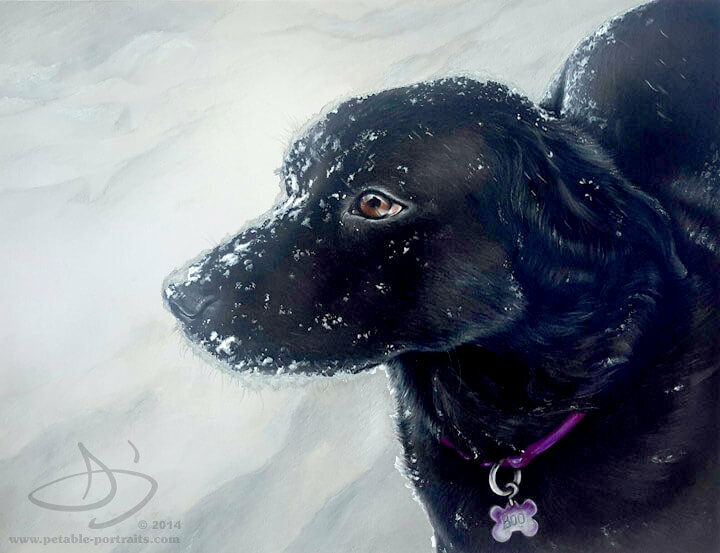 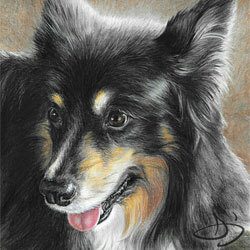 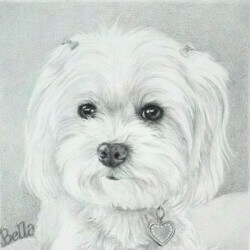 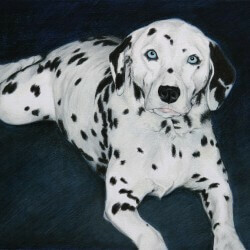 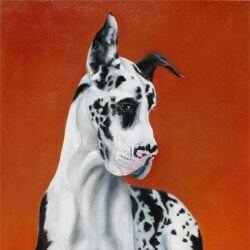 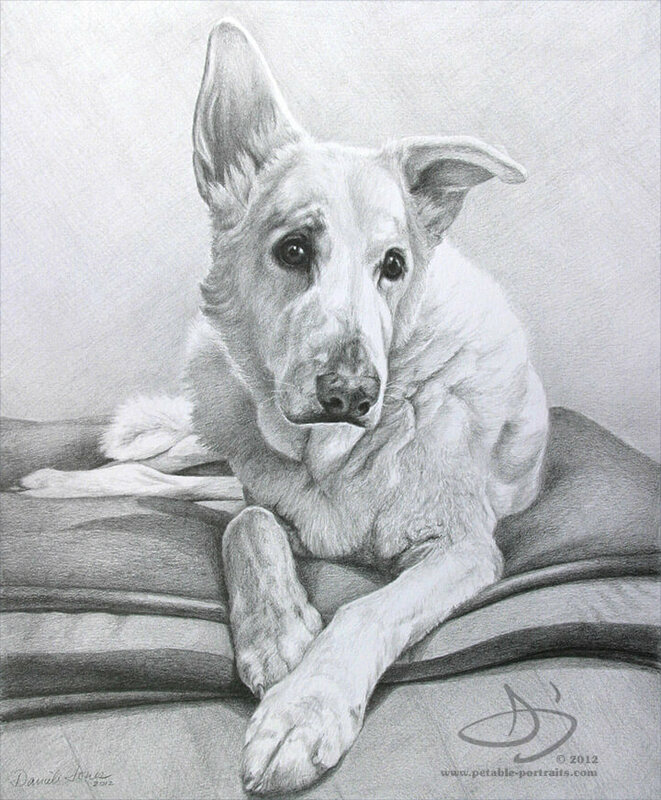 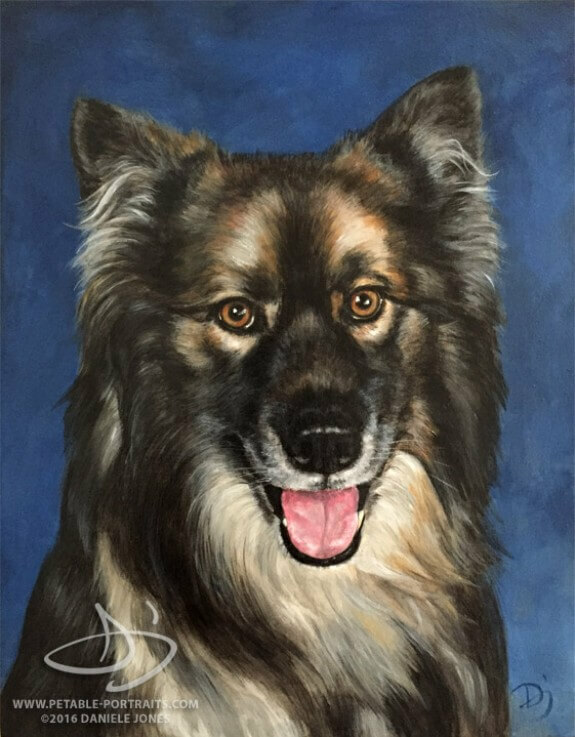 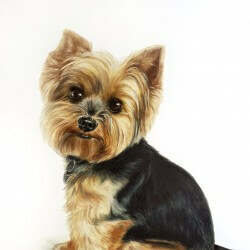 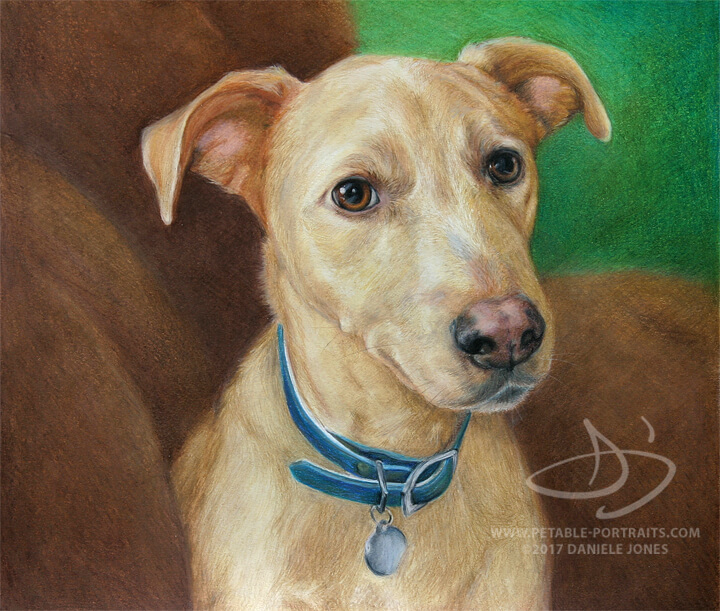 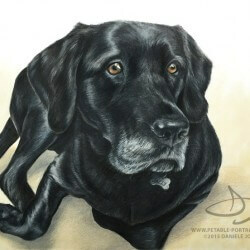 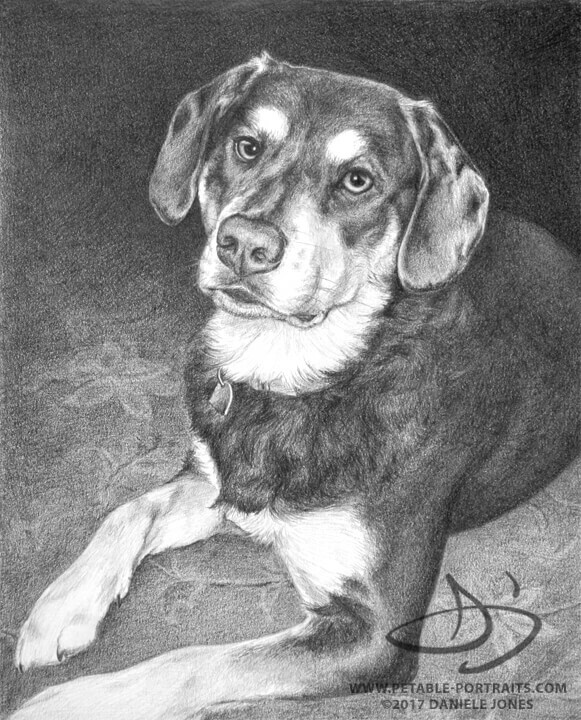 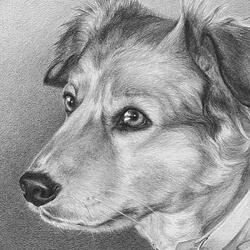 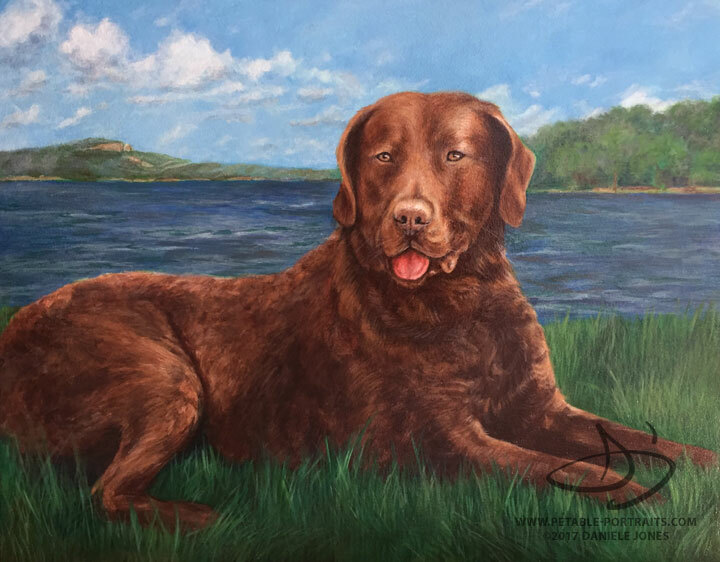 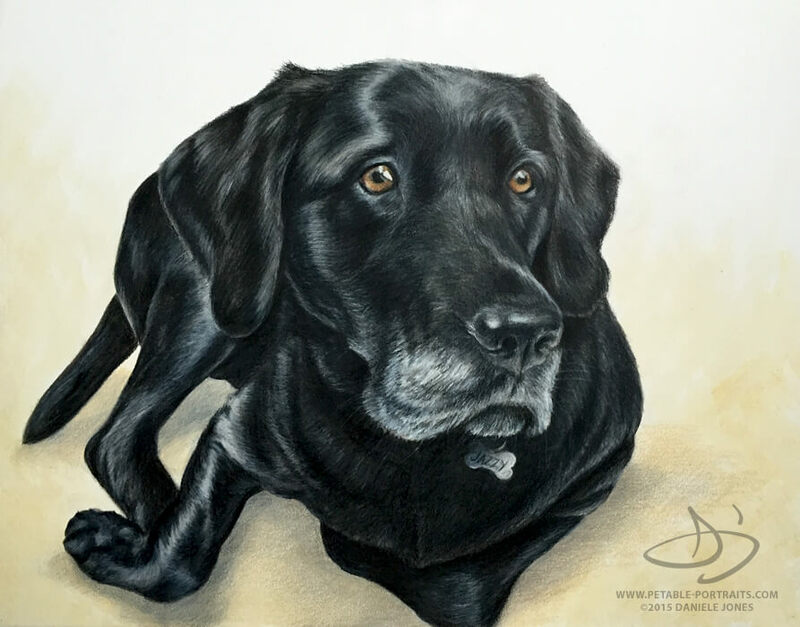 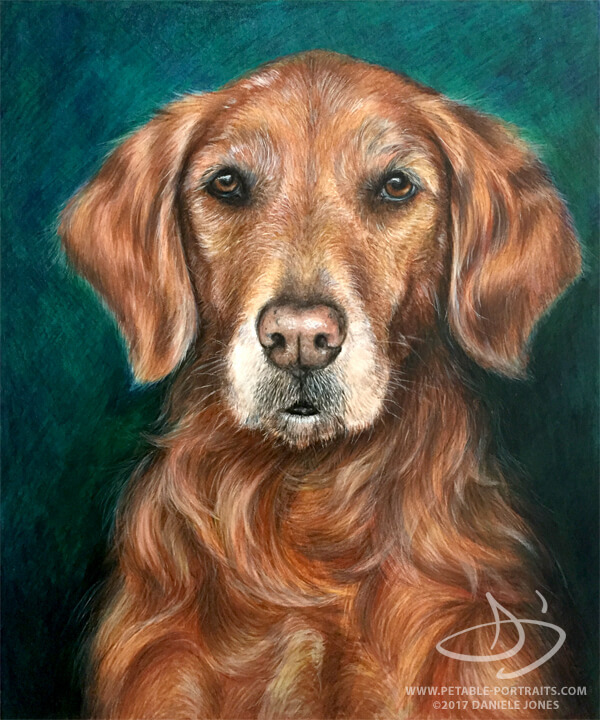 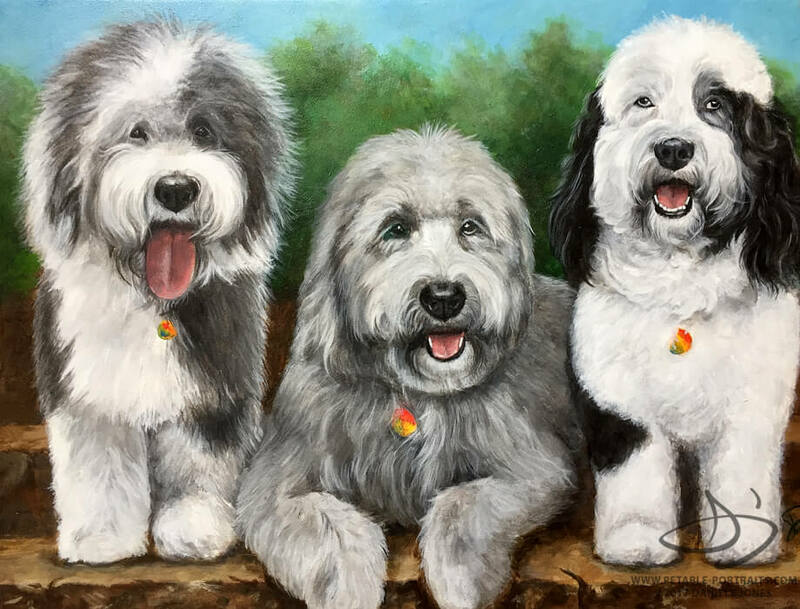 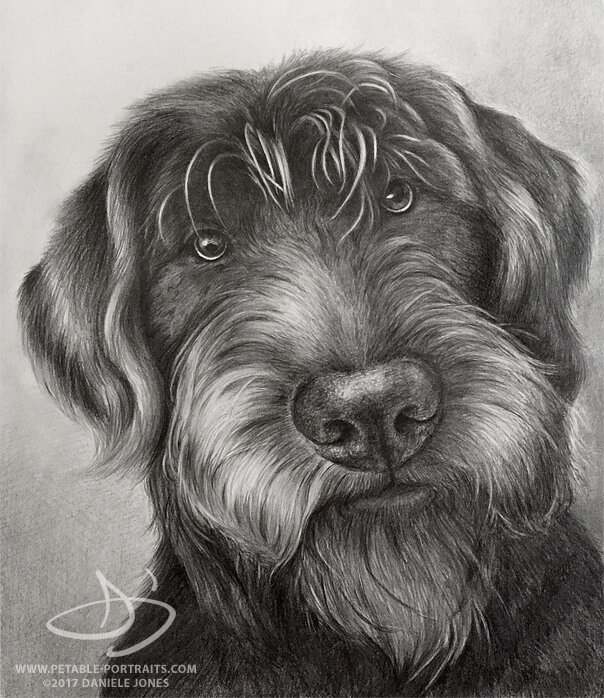 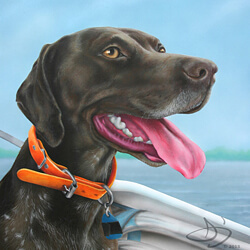 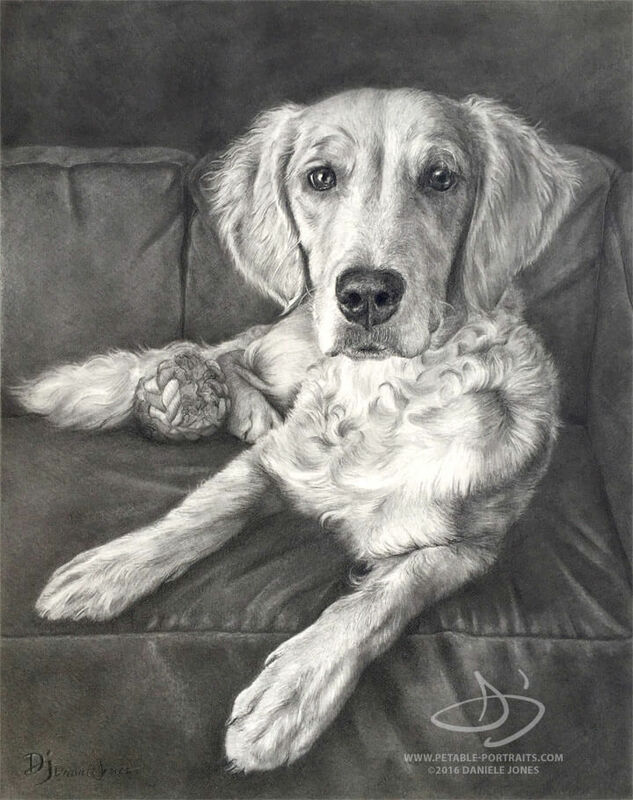 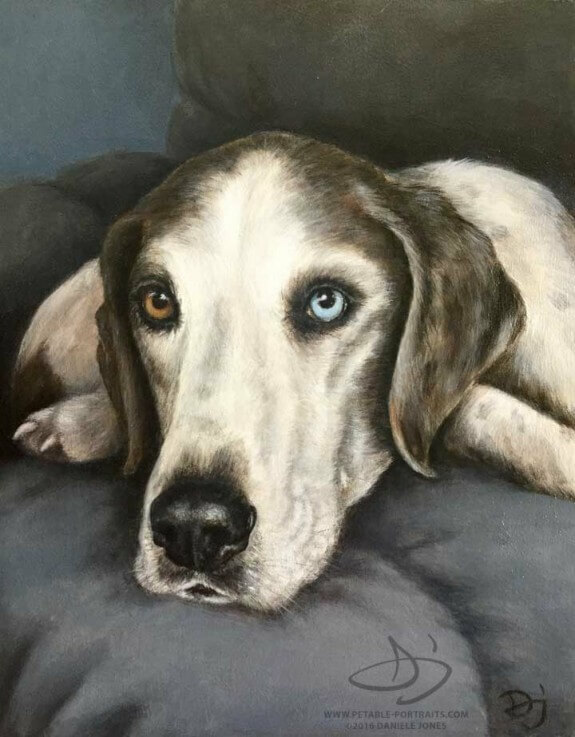 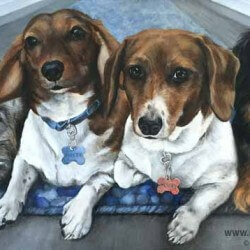 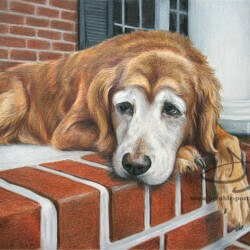 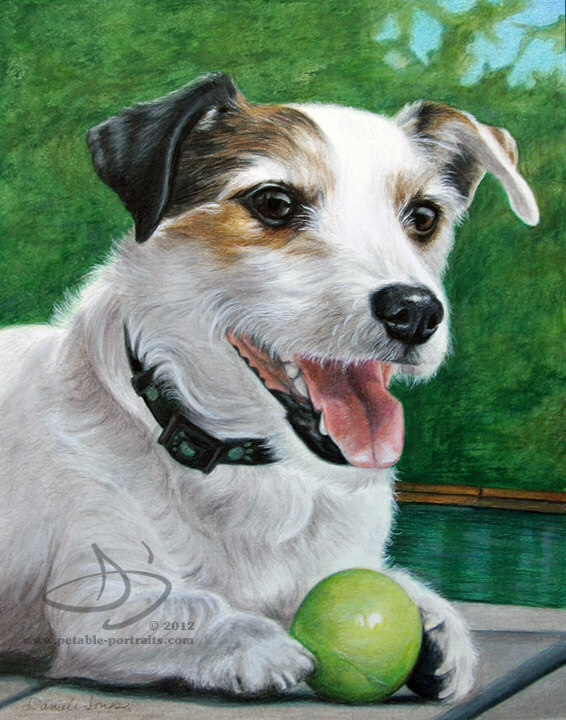 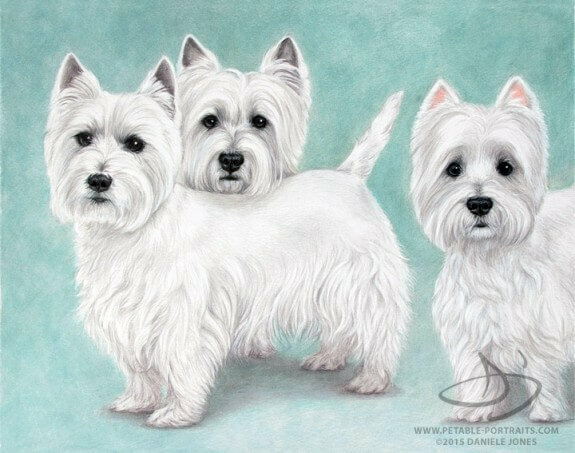 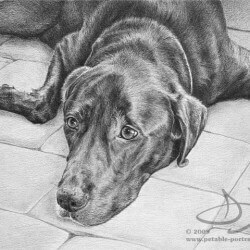 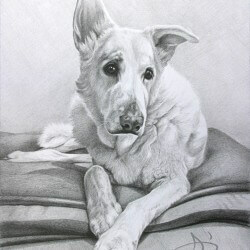 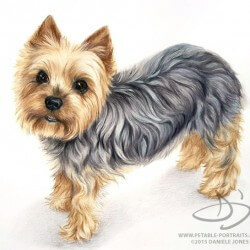 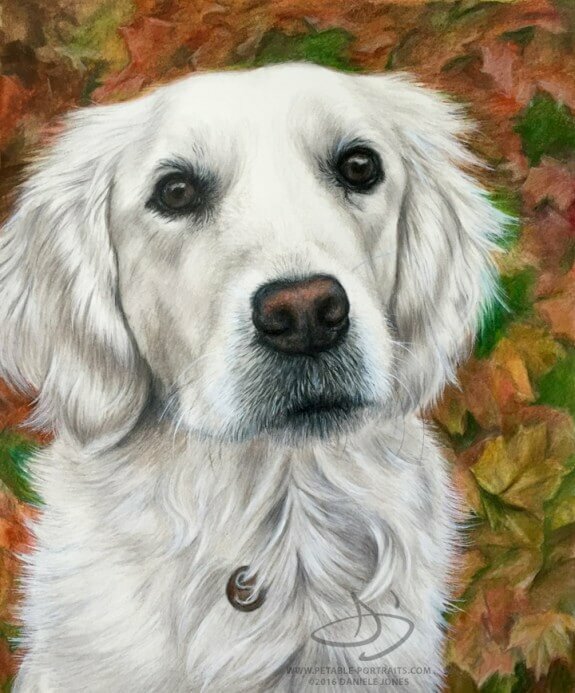 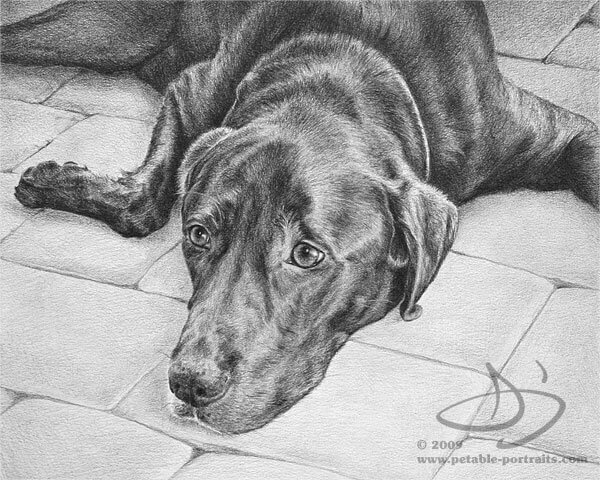 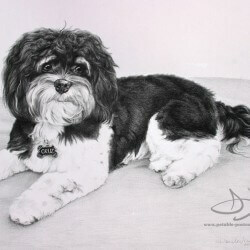 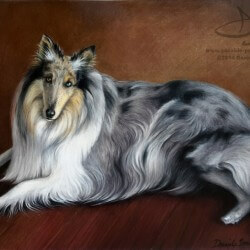 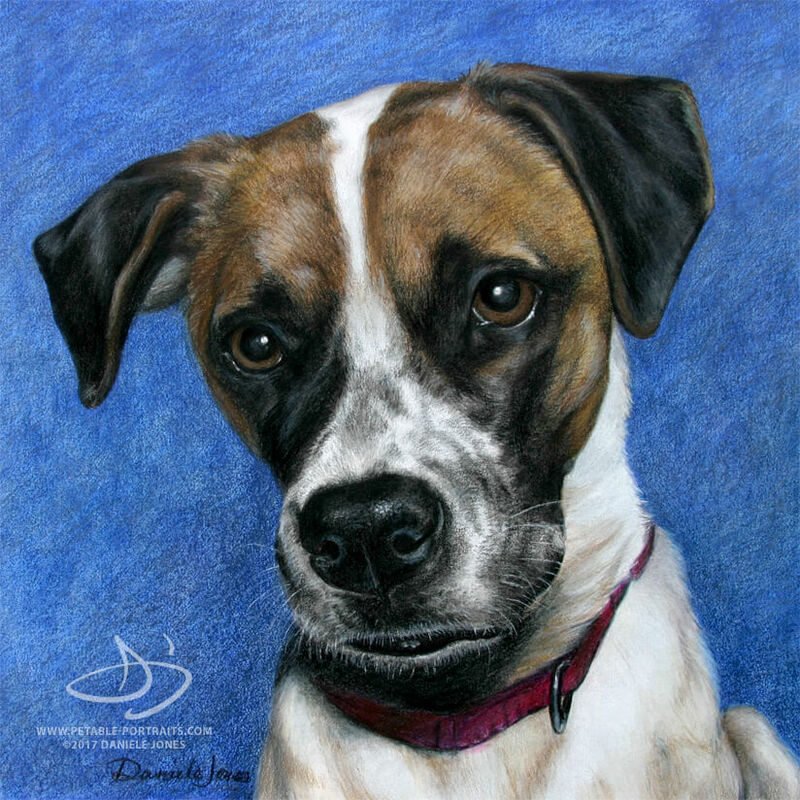 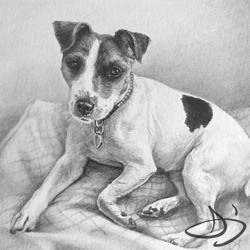 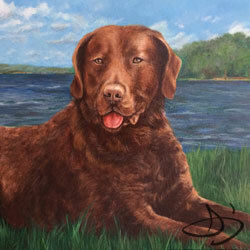 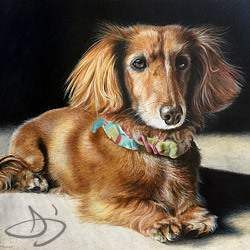 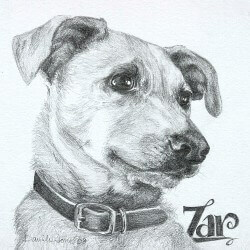 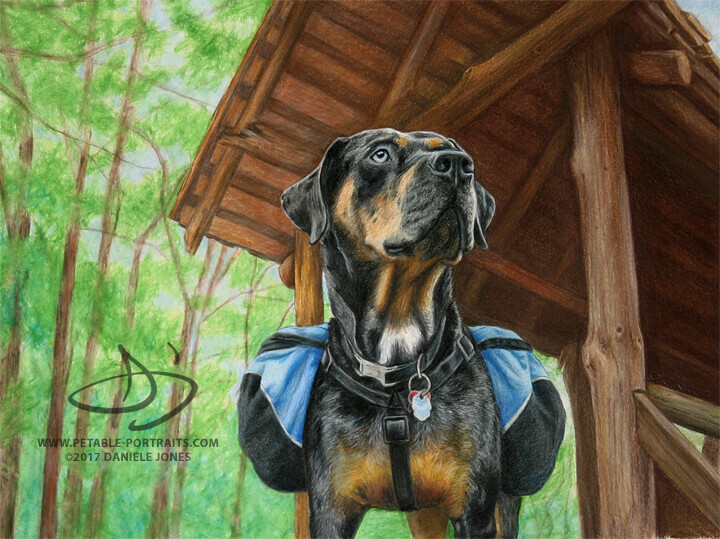 Many of these dog portraits were commissioned as gifts - birthday, Christmas, retirement - you name it. 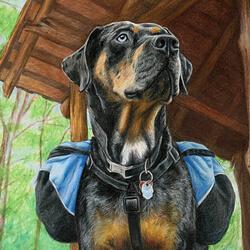 It is hard to keep the secret though, so be prepared to have an iron will! 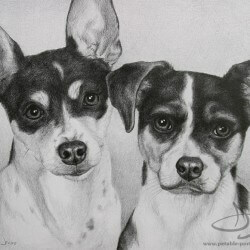 If you have waited a little too long to commission a portrait ask me about a gift certificate. 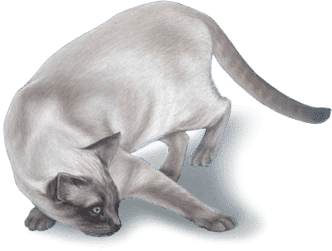 Click any image to open a slide show.